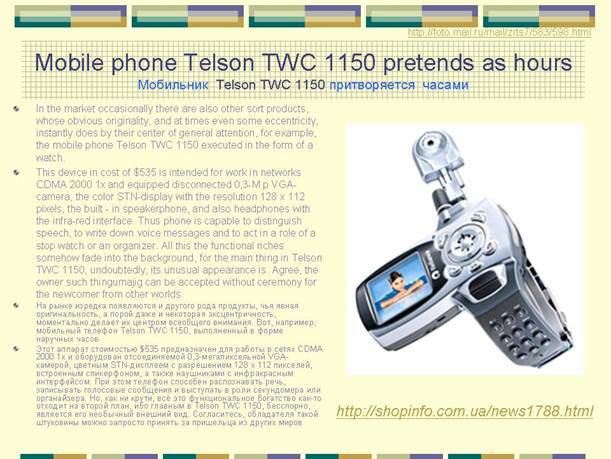 How “predictors” read magazines about mobile telephones. Once at the swimming pool, I had to wait until I would be able to enter the locker-room and the administrator asked me to sit in a comfortable armchair and read magazines. On the table there was a pile of free-of-charge distribution magazines “Toys for adults” for October, 2007. 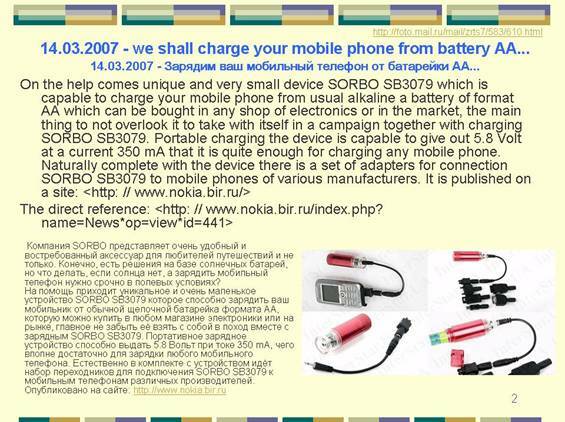 The major part was devoted to mobile telephones of all makes and colors. Of course, the first thing that struck my eye, the eye of a potential consumer, was the variation of mobile models on the parameter which is generally called “dinamisation” in DLTS(Laws of development of technical systems) –TRIZ (the theory of innovative problem solving). The term “dinamisation” is probably not very relevant because the meaning we put in it can be described by the sequence: monolith, hinge, many hinges, elastic connection and force fields used to maintain communication between elements. That is we describe variants of links between elements of portable things. The same term can also describe sequence in change of typical evolutionary conditions, i.e. change of matter state of machine working head: gas, fluid body, solid body, plasma medium, phase changes, combined conditions such as foam, jell, spray, grains, scales and so on. This term also may describe some market tendencies such as producers and sellers’ efforts to reduce the value of a model to speed up sales. The limiting state in this tendency is “the transition to disposable goods”. Using some imagination this can also be related to increase of dinamisation if we take into consideration quality-price ratio and customers hesitation: it’s psychologically easier to buy a cheaper thing than an expensive one with the same quality. In spite of this term having many applications, it is “historically determined”, having entered professional slang. This lets experts from different countries communicate without any language barriers and there is no need to substitute this term. 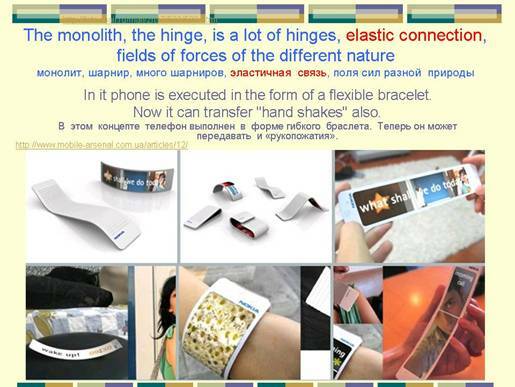 The magazine I was holding in my hands evidently demonstrated that according to the idea which is called “the law of raising denomination” in the classical TRIZ, modern mobile telephone turned into a set of portable folding gadgets which demonstrate all kinds of typical evolutionary conditions that we describe by the sequence: monolith - hinge. Exercises on recognizing principles can and must be done on any material. The magazine which I got by chance immediately let me do my favorite work: practice in recognizing principles of development, principles which I prefer to call “possible and frequent scenarios”, instead of traditional term “lines of development”. Why? I’ll explain it a bit later. This is my old game or “training” to which I always add my second favorite game – search for analogies of what I see in the history of technologies. So the first initial condition of the mobile telephone in “denomisation line” is “monolith”; we have no difficulty recognizing them: these machines are in the form of “a brick” or “a piece of soap”. The second condition is “a hinge” – I immediately found it in the magazine. At once I chose from more than 300 pictures only 2, with variants of opening similar to the ways of opening of books and notepads. Phenomenon of turns of axis and direction. In the picture above “the phenomenon of turn” is evident. 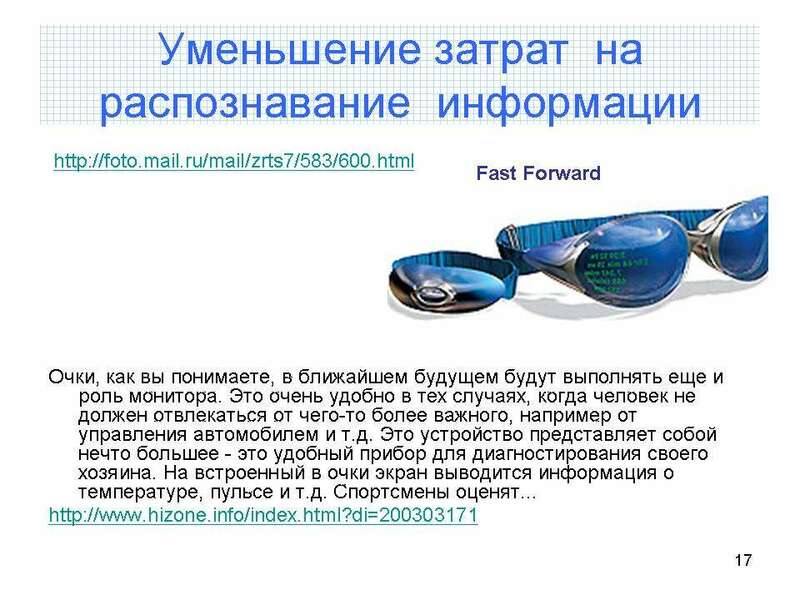 Being aware of its existence I found the second variant of this phenomenon displayed in the pictures of the magazine. Analogy from the world of boxes is on the next slide. The big idea is that one of observations TRIZ uses in its ways of making solutions sounds like the following “forward movement of the working head always transforms to rotary movement”. Once I doubted this thesis and found out many contrary examples: “rotary movement transforms to forward movement” as in guns and pistols with a flat magazine or in a wheel flintlock and cocking system of a helical spring and etc. At the same time I discovered that often “forward movement transforms to forward movement” and “rotary movement transforms to rotary movement”. So I came to the conclusion that it’s not good to “align” variety of movement kinds because engineering systems often develop in all possible combinations at once. Vacuum cleaners with “forward movement of air and dust” replaced traditional way of cleaning carpets, Gobelin tapestry other things. The traditional way used by our pets, dogs and cats, is shaking. In other words, speaking LDTS language, old cleaning “machines” used “impulsive type of movement”. The broom, which can also be used as “dust and rubbish remover” from a carpet, demonstrates forward movement along a treated surface and works like a scrubber or a spade for snow. The vacuum cleaner demonstrates two types of forward movement: air moving orthogonally the surface and a brush with the whole moving along this surface like a broom. More than that, we all know about modern vacuum cleaners which add to all the movements listed impulses – “clapping on a carpet”. Such a long excursus from the main idea of my narration is explained by the fact that “search for turns” or “investigation on turns” is poorly studied but is surely useful because such phenomenon in systems’ development really exists. If there is a phenomenon it can be used in other fields of technology. 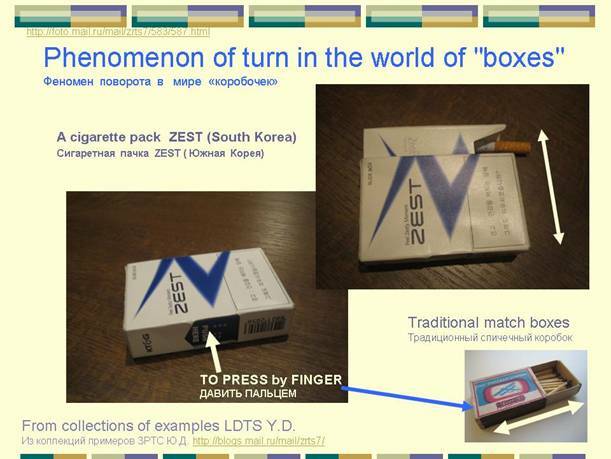 for example a box of South Korean cigarettes Zest (you can see a micro- b-roll) http://video.mail.ru/mail/zrts7/729/ and usual boxes for keeping matches. Phenomenon of turn in the “world of boxes”. From LDTS collection of Y.D. 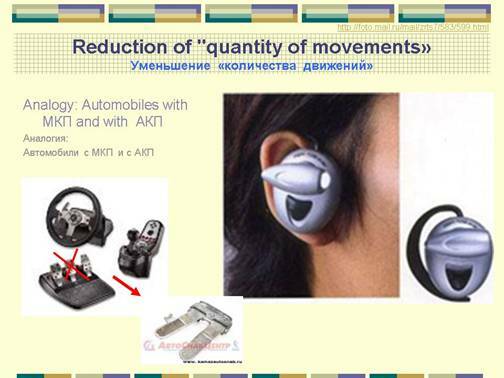 To show the next slide lets turn to the observation from classical TRIZ that “forward movement transforms to rotary movement”. It seems to me that the word “transfer” which is generally used in LDTS vocabulary is practically irrelevant. The word “transfer” means that something transferred into somewhere and it can’t exist in its old place. So the question is in a certain act of “disappearance”. The appearance of new versions of a machine is accompanied by different “disappearances”. Today it’s difficult to find a sliding rule but only 30 years ago this honorable calculative machine was on the place of honor on my father’s desk. My father was a planning engineer and that rule was presented by his colleagues. The inscription was engraved on it “For the 25th anniversary from comrades-in-arms”. I’ll have to make one more logical excursus: in LDTS investigations nobody ever calculated: what percentage of machines really leaves the stage and what percentage remains and simultaneously coexists with the old variation. 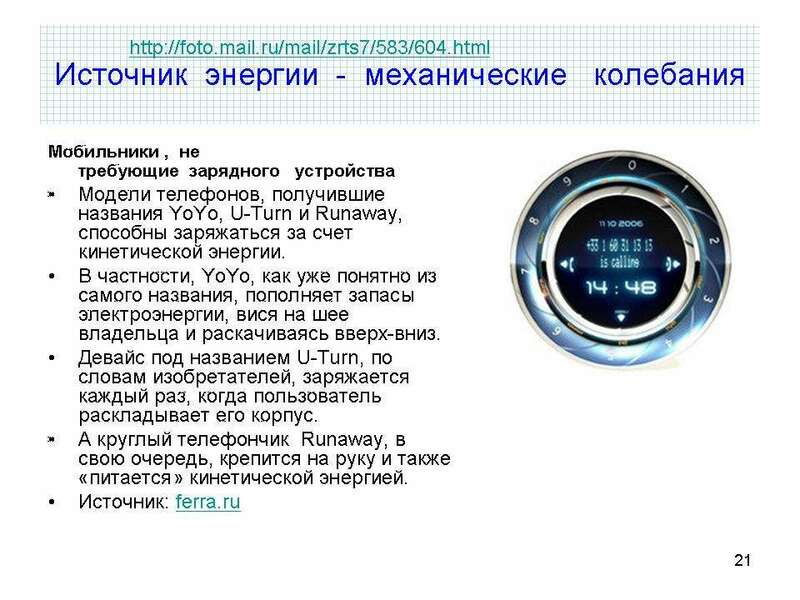 Some years ago I wrote to my good friend, to one of the most honorable LDTS developers, Boris Zlotin that it would be wise to investigate characteristics of long living systems such as the Kalashnikov gun, legendary and my adorable Volkswagen Beetle, mechanical watch, scissors, coffee-grinder and so on. We would have a set of certain ideas about what machine must be to be in the market longer. Push to these speculations was the opinion of one gun engineer who said that in the system of “individual small arms” the most famous and consequently the most successful have about 49–52 parts, all unpopular have more than (75–90) or less than (36–39).I can not give the reference because it was closed seminar on innovations. However the only result was the invention of a would-be scientific americanism “perfect systems”. The problems of “transitions” (so it means disappearances’) is open and the project of a possible thesis work for TRIZ master degree “Machines-long-livers and techniques of appreciating possible length of a product life” will be interesting not only for TRIZ specialists, but for marketing specialists, project-managers and specialists in industrial espionage. I have just enumerated institutes that exist in parallel and have many problems and products similar to TRIZ in many aspects. Giving my training course I’ll make such excurses from time to time. Many of our readers are at the same time “TRIZ developers” and this training course is a part of TRIZ developers’ summit program http://www.triz-summit.ru/ru/. Questions that arise during the course are referred to the users of the site. So now we can go back to the “transitions” discussion on the subject of mobile telephones. To demonstrate the possibility of a simultaneous existence of DIFFERENT ways of moving of working organ and to doubt once again the relevance of the word “transitions” I suggest you look at the next picture from the same magazine. 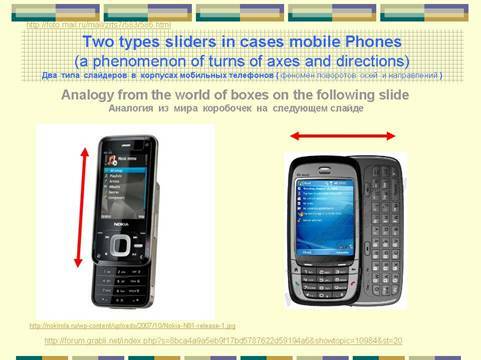 Mobile telephone case of “duplicator” type perfectly coexists with telephone case of “slider” type; two variants were shown in the previous slide. The same situation of simultaneous existence can be found among knives: a sliding knife and a usual pocket knife, which folds on the principle of a fan. The next evolutionary step in “dinamisation” distinguished by researchers is called “many hinges”. I didn’t really find “many hinges” in case construction of mobile telephones but the telephone below can be referred to this condition with a certain degree of imagination if you understand that the hinge inside has two degrees of freedom like a desk lamp with a flexible neck, but not one as in a fan. 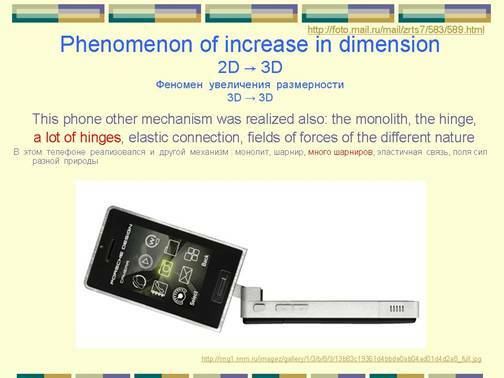 The phenomenon of increase in the number of dimension axis. This very telephone can also be interpreted as a machine which takes place in a famous trend “point – line – flat surface – volume” and can also be called the phenomenon of increase of dimension. The example of this scenario demonstration is simultaneous existence of a brush (dimension 2) and a paint sprayer (dimension 3),a vegetable grater (2) and a blender (3), a foil (1) and a sward (2), a nail (1) and glue (2) and etc. 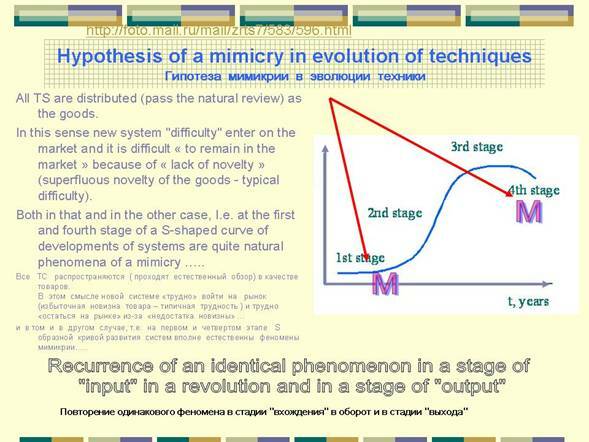 LDTS investigations of famous specialists A. Lubomirsky /1/ and V. Petrov /2/ showed that “there may be progress” as “lengthwise force line of tendency” and in opposite directions. My own investigations made me sure of this too /3/. Generally speaking scenario demonstrations of development in one and the same machine have complex nature. The following word picture can be an example. Laws of machine development as a set of frequent scenarios can be compared with a thick colorful wire bundle in every of which there is current. This bundle connects a complicated matrix of machines – relatives, for example, mobile telephones. It is connected with other sheets of matrixes, i.g. close relatives – “desktop phones”, telegraph, post, semaphore, signal fires and so on. In each wire of this “bundle” there is current. However in some joints and “wires” current factor can be a little bigger than in the rest. I’ll remind you that in this part we’re talking only about case construction, structure, covering not a big part of machine characteristics. That’s why the number of examples is not great. We should study all aspects of development of mobile communication technology but this is a detailed subject for an independent training course. As an example of a simultaneous demonstration of many laws in one and the same object the following slide can be shown. 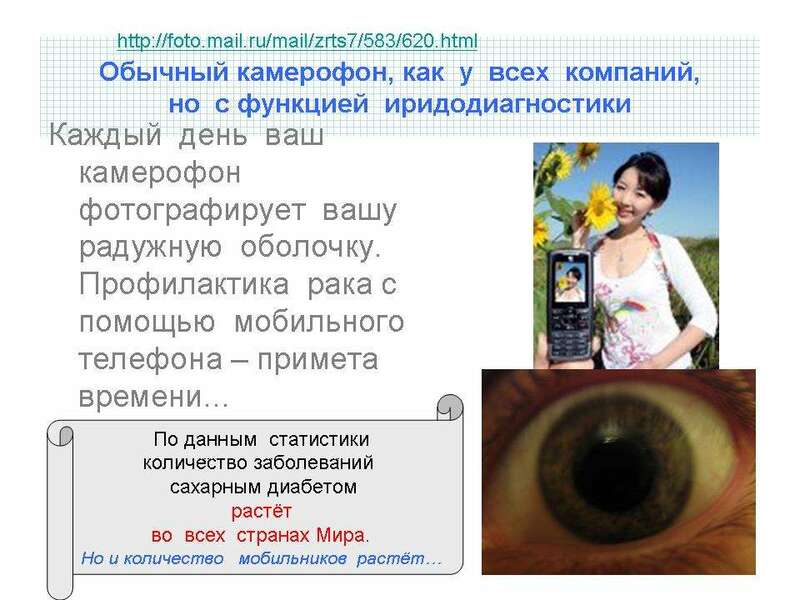 5) “getting the zone of attractor” because 2 machines from the zone “need for information” are united http://foto.mail.ru/mail/zrts7/583/594.html. Within the framework of this review I don’t have possibilities to discuss all the advantages and disadvantages of my hypothesis in details. That’s why I’ll only tell about its main points in brief. If all the machines are considered on the classification of needs which they satisfy and build a matrix you see on this slide, it’s possible to notice that examples of getting in the zone of “need in square” are numerous. An example is the air conditioner. It doesn’t only clean and cool air in the room meeting biological needs in clean and cool air. Pay your attention; these are already two parameters that the conditioner supports. Conditioner can unite (it already did 3 years ago) with a molecular filter which increases a bit the concentration of oxygen in the outlet zone. So you can see that 3 parameters from one line of classification of needs are already united. That is to say the conditioner made a step forward in the direction of biological needs meeting (concentration of oxygen is 21,2%, not 20,9%, as in many living spaces at night). It’s evident that such conditioner has higher competitive characteristics and as a result it has more chances to become a “long-living machine” we have already spoken about above. If it obtains the “self-cleaning filter” function (it already appeared and was used by vacuum cleaner designers) it will make one more step forward in the direction of biological needs meeting because the risk to get dirty air after a long conditioner running is reduced. It’s again a new competitive characteristic. To strongly simplify all the apparatus of attractors described I can say the following: it’s very “profitable” for people to project machines that get into the zone of “attractors» because this is a certain area of special advantages. A hypothesis is a hypothesis. It needs verifying and can be used for preparation of a qualifying research not only in the system of MATRIZ attestation but also on the subject “management of projects”. As far as I know, the All-Russian qualifying committee deals with projects in this area. 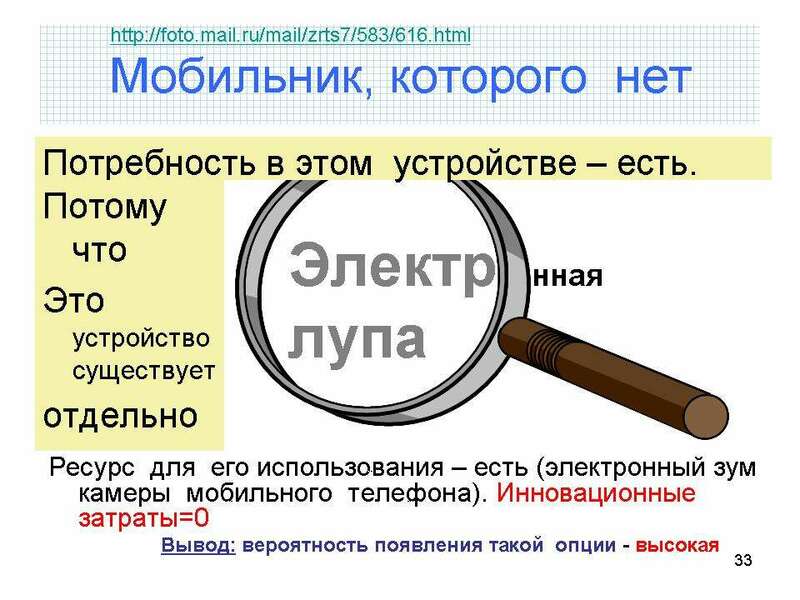 Let’s come around to the investigation of the “dinamisation” law demonstration - monolith, hinge, many hinges, elastic connection and use of fields of forces to make connections between the elements. 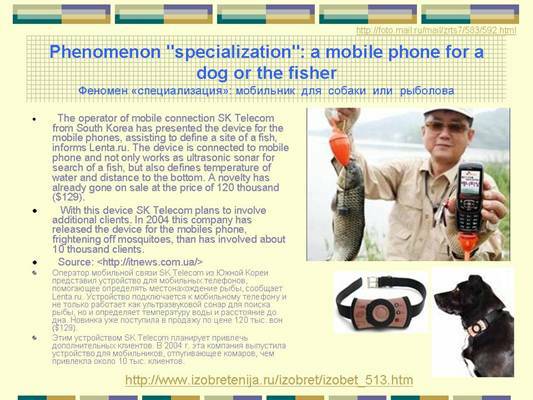 There was not the mobile telephone specific for the evolutionary condition “elastic connection”, but my profession of RIZ expert always makes me search for new necessary information to make projects. That’s why all novelties in “mobile building” I find either together of my project making or on the purpose. 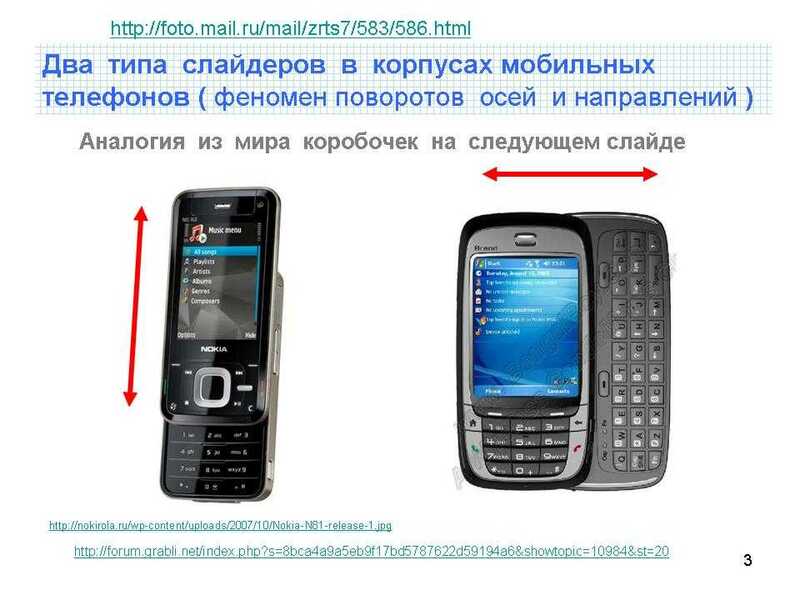 Flexible mobile telephone appeared 3 years ago: look at the slide. 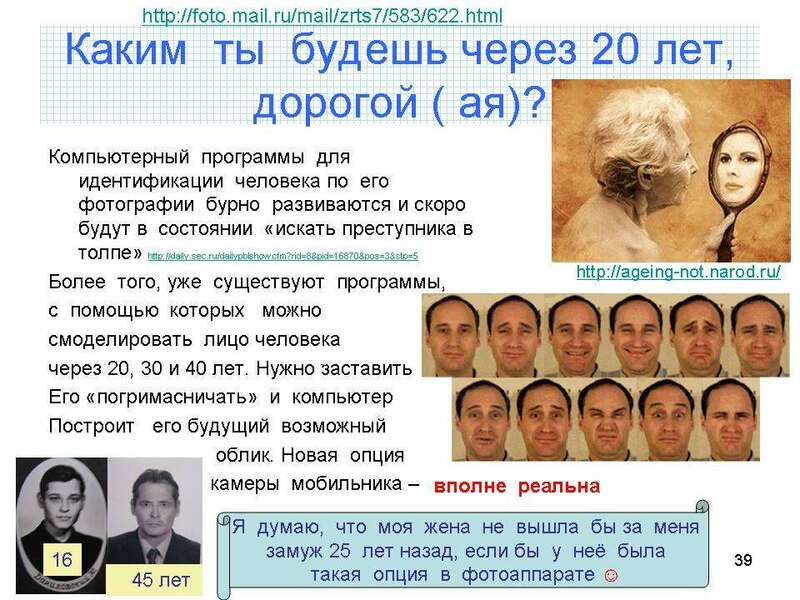 Not a long time ago all MSM celebrated its 20th anniversary двадцатилетие его изобретения.. It’s interesting to know that in the history of “a smile” were cases of patent racket – specific peculiarity of our time and simultaneous invention of one and the same system in different countries http://www.vagrant.ru/archive/index.php/t-4042.html. In the end of the seminar we’ll discuss this subject in more details. Now I’ll only notice that in this “concept – telephone” which is not in a sale yet there is a distinct demonstration of one of three fundamental laws of equipment development – law of transfer of quantity into quality. “Quality” in this case is the increase of degrees of freedom and the quantity appeared as the result of it is the possibility to make two channels of communication instead of one, verbal and tactile. 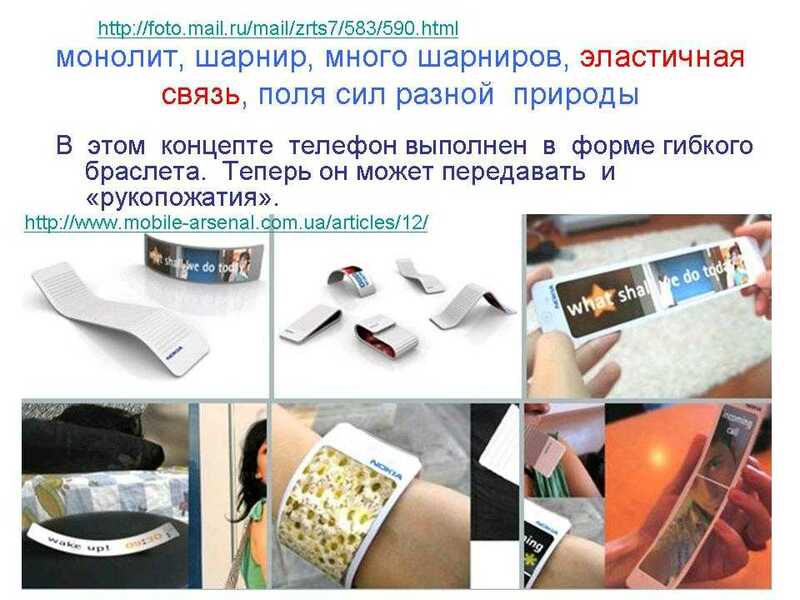 To see how the flexible screen looks like you can in this video clip. However tactile feelings have already been used in telephones long time enough. I mean option “vibration call” which allows receiving calls with the ring signal switched off. If the telephone on the slide is started manufacturing it will be possible to speak about realization of one more dialectic law – law of negation of negation. Terms and formats of Hegel dialectics is not very convenient for work in the specific area where we are. That’s why instead of inconvenient word phrase “negation of negation” it’s easier to use the term “helicity of development” or “repetition of development”. 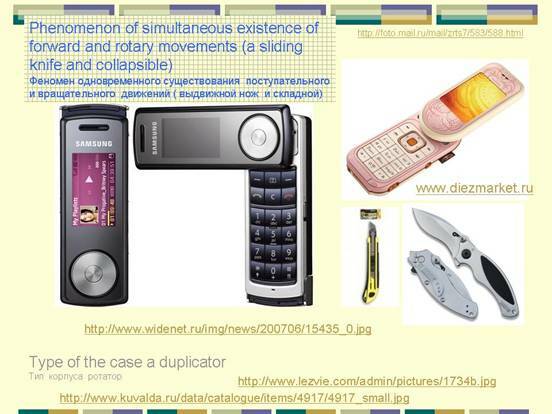 LDTS always sets itself up as applied dialectics which even historically based upon the hypothesis about the existence of dialectic contradiction between different parameters of one and the same machine: a telephone must be small to take little place in a pocket and must be big enough to use it. It turns out that something we called “dinamisation” in the beginning of our review is a simple variation of the way of this contradiction resolution and “dinamisation” itself is the result of existence of the main Hegel law of unity and struggle of opposites. In one of the future reviews we’ll surely do a training course on the recognition of all three main Hegel laws of technological systems development. This lets us look at those TRIZ systems which have already been developed and used in the practice of analyses by TRIZ experts from another point of view. We’ve already said that in the development of technologies everything is “balanced” and ancient Chinese symbol “Yin-Yang” symbolizes this situation in the best way. Engineering systems may develop both in the direction of “machine complication” and in the direction of their “simplification”. In TRIZ experts slang this phenomenon and a complex of developers’ procedures are called “trimming”(TRIZ + FCA functional cost analyses of Leon Miles, adapted and developed in the structure of TRIZ analyses by S.Litvinov and V.Gerasimov in the end of 80s. In the magazine that became the reason for the training course there were also examples on the “trimming” phenomenon. 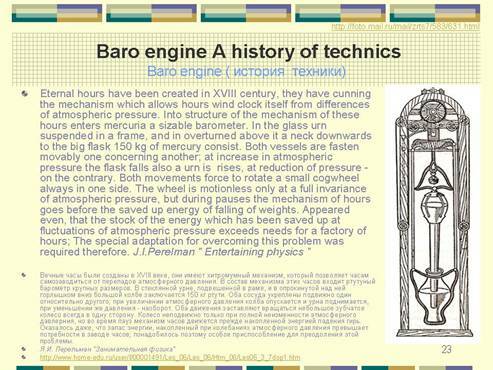 I added this section with the examples from my collection which is renewed every working day so you can see this slide. As a rule (but not obligatory) trimming procedures are connected with “specialization”. For example, mobile phones with 5 buttons on this slide is intended for using by old people who don’t need a screen very much because of weak eyesight. They don’t need SMS, MMS options, games and other things traditionally enforced by produced (I use only 5 options from 20, for example). The second “specialized mobile” is a simple supplement to a laptop which already has both a screen and a keyboard. In this construction we see not only trimming but “the phenomenon of use of environment recourses: fields, materials and other machines”. Recourse mechanism of improvements in equipment is observed everywhere. For example, recuperation of movement energy in a hybrid automobile. Every slowdown allows charging electric battery. Even a new class of equipment appeared and it is figuratively named “nonbattery electronics”. Some devices need so little energy so you can use your hand only to make a little electric energy to activate, for example, “electronic switch” which opens the lock and many other things. 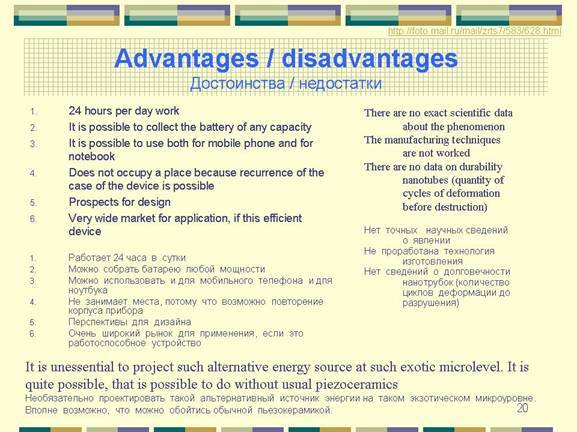 In mobile telephones the idea of man movement recycling for additional source of power is very popular now. This is the example of a telephone which imitates a famous YO-YO game. We’ll discus many of these examples, when reach the recognition of “the laws of development of power sources”. I “nipped on ahead” only because I wanted to illustrate once again “plaiting”, “interconnection” of ALL identified laws of development. Thus, relating to the current part of our review we can say the following: “trimming” phenomenon, (as an antipode or “dialectic pair” of the tendency to complication), “specialization” phenomenon (as an antipode of a tendency “intention to universality”) and “use of environment recourses: fields, materials and other machines”(as an antipode of a tendency to “independence duration increase” exist independently as phenomena and are connected by cause-effect chains of relations and they are badly studied yet. We know that some phenomena are obligatory “satellite” (or “features’) of other phenomena but I don’t know a really reliable source on these situations. The most “suitable” TRIZ manual for today is of S.Litvin, A.Lyubomirskiy I advise to use for practical work with a big caution. But as a fact-finding material it is very good. At least in the approach of this manual the idea of “interlacing” or “co – evolution” in the form of “connected with each other” all identified laws is not ignored. Simply in the period of its creation there was enough stored and reliable material on the history of technologies and gadgets. TRIZ was started with the idea of patent files analyses which can teach only “how to project to make the probability of implementation 15 %” (this is the USA statistics about the patent use, in our country 10 times worse -1,5%). So it means that the problem “how not to project” was thoroughly studied all 50 years. As I have already said “specialization” can be not connected with “trimming’. On this slide there are two more examples of how “specialization” demonstrates itself. 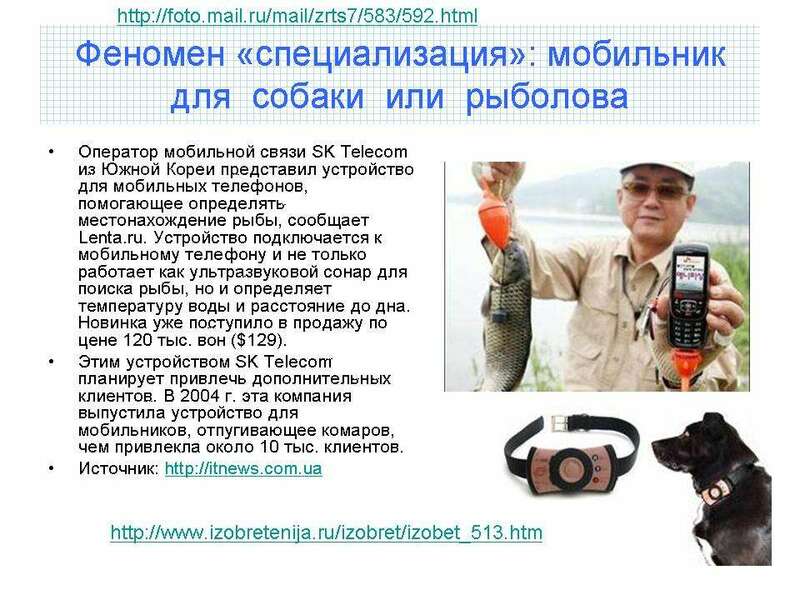 mobile telephones for fishing lovers and camera with mobile telephone build in a dog-collar. 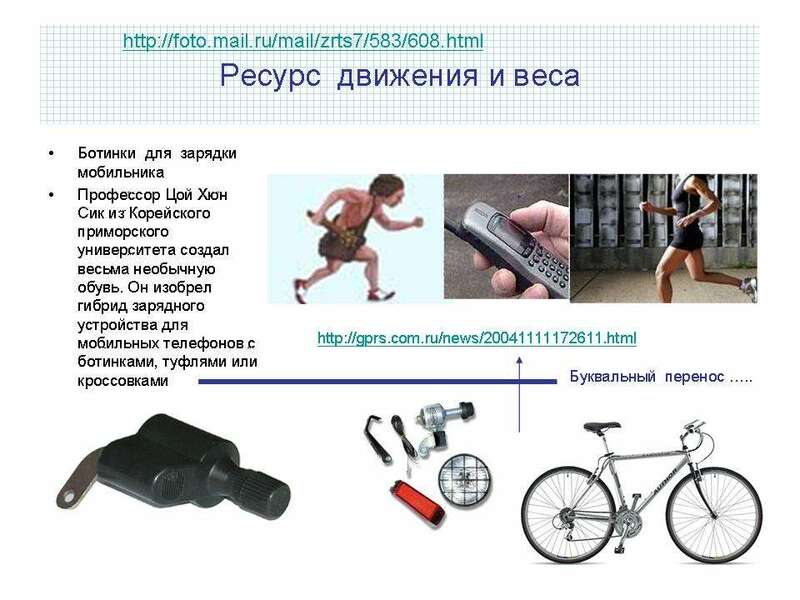 Analogies for the first example: “gods for fishermen”: clothes, chairs, cases for belongings. There are no any ideas of “trimming” here Vice versa there is evidently frequent combination type: “combination with informational and measuring systems”. You can see more details about this combination type here. 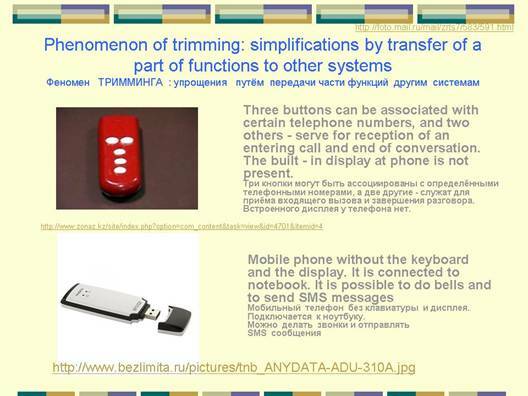 Analogy to the second example: bipper mechanism in usual telephone responder which allows listening to stored messages without entering the house. 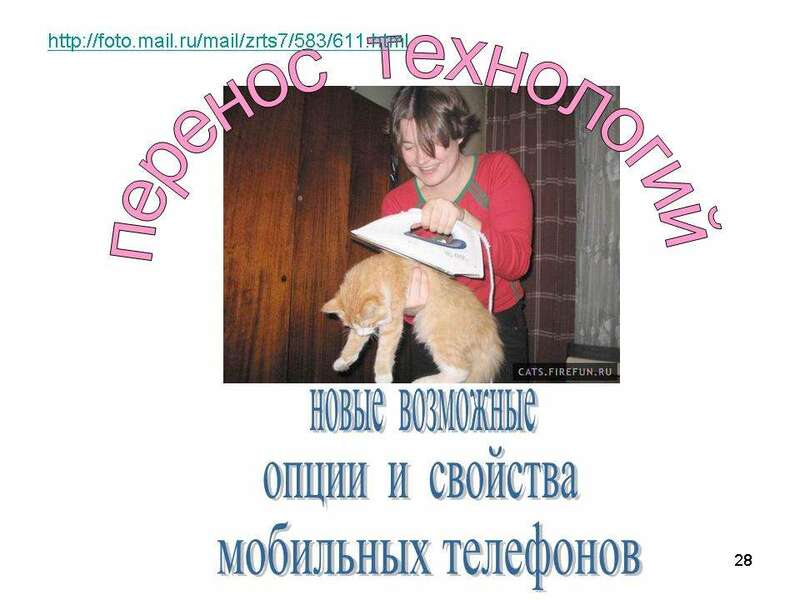 Here “simplification” towards “human mobile telephone” is evident because dogs don’t call on the mobile telephone yet. ( I think because they are lazy J). In the magazine I looked through with pleasure there were many examples of “technical mimicry phenomenon” which can be considered as bright and remarkable “satellite of age” of systems. Relatively of course because we are speaking again about the hypothesis. Research showed that this phenomenon is peculiar not only for the situation “age of systems” but for the situation “youth” or “entry” on the market. It is well known that one of the reasons of many projects failure is “superfluous, frightening novelty in innovation”. That’s why it is rational to investigate “how many novelties” is permissible to use in the project and to what “habitual image” it is possible to do “actions on technical mimicry” to reduce innovation risks. 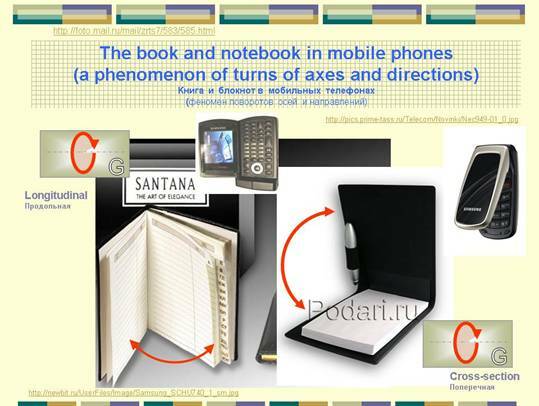 Examples of this phenomenon in the review were many: remember mobile telephones that copy a book or a notebook, sliding knives – with side either direct movement of the blade. It is often difficult to draw the line between “phenomenon of technologies transfer” and phenomenon of“technical mimicry”. I think that in community of professional researches, which is forming in MATRIZ system step by step, these questions will be discussed in more details. Nevertheless, interest to the problem of technologies transfer with the phenomenon of “technical mimicry” as a part is very great. Functionally oriented search as an instrument of problems solving brought many consulting companies to success. I think there will be thesis works for TRIZ master degree and culturological research on this subject in the field of engineering systems because there are enough blind-spots here. In my research I tried to build a classification system for technical mimicry phenomenon “from organs of the senses”. However this is not the only structure of classification. There is the whole complex of examples where it’s better to talk not about organs of the senses but about surrounding machines of one and the same “technocenosis”. Look how a usual telephone “pretends” as a buckle or a rucksack strap. 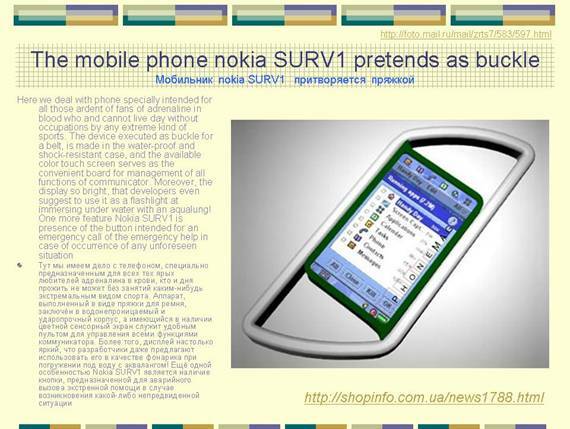 Mobile telephone in the shape of watches has many variations of performance by different producers. in the collection of my virtual museum at this page pageстанице or here здесь. Let’s study the phenomenon we often meet in different fields of technique and even on the level of change of many machine parameter points. This is an example of “reduction quantity of movements”. It’s clear that people have always wished to make tools that needed less movement, less use of limbs and less efforts in using tools. The bow, crossbow, gun and rifle need, all needed two hands and a shoulder. Individual small-arms – pistol with flint- lock needed 2 hands, the revolver and the automatic pistol – only one. Control organs of a car always needed two hands and two legs. After the automatic gearbox invention it’s possible to use only one leg that is more comfortable. Cruise control (automatic support of chosen speed) lets not use legs at all. It is even more comfortable. After I turned 45, I began to use this option constantly: less tiredness and a real economy of fuel, always growing in price, as the computer measures fuel economically. This scenario is in one row with such phenomena as “cheap things” (things with reduced operating duration), “disposable things”, “expensive things” (things with high operating duration) and more often purchased gadgets “of reasonable price/quality ratio”. In classical TRIZ there is a procedure of projecting, which is called “use of cheap fragility”. 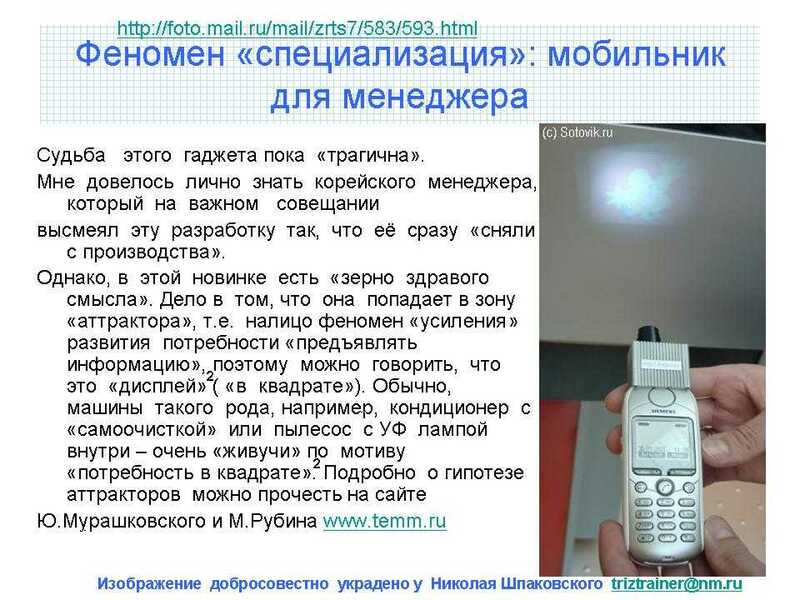 Knowing about this procedure and about this real existing scenario in technique development we can easily find in the Internet true facts of existence of “disposable mobile telephones”. Here, however, the decision in favor of “disposability” comes across with not a typical difficulty for such an approach. Usually any disposability matches the concept “recycling economics”. The matter is in the famous book of Japanese authors where it is suggested to make things from paper, metal, glass and plastic to use mineral resources as less as possible. 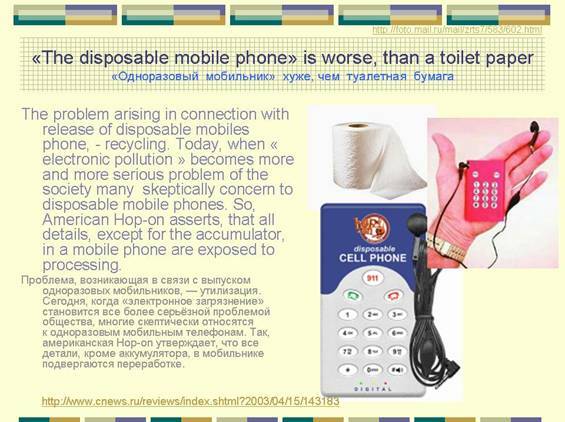 Unfortunately “disposable mobile telephones” is an example of a new “great problem” – recycling multicomponent electronic garbage. In regard to the classification of “ the cost of the carrier of a need satisfaction” there is also an unverified hypothesis that in all things which contact a man directly (fridges, vacuum cleaners, furniture and etc.) structures of price segments are similar . If these laws are determined then while projecting a new thing you’ll immediately get the limit in cost (prime cost) which cannot be exceeded because you know to what price bracket a created thing is corresponded. This “limitation” makes you choose between this and that private decision on the actual design. 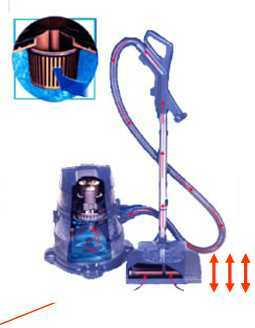 For example, what way to choose to manage power of vacuum cleaner work? Pneumatic? It means to make a whole with a regulate cut to relieve from a stick curtain. Or may be to prefer “electric decision”? It means to use resistor to reduce the power of electric motor work. The first decision is cheaper than the second and its characteristics of reliability are much higher. However the second variant is more convenient for a user. It’s an example of typical “dialectics in engineering philosophy”. This is the continuation of series of examples of expenses reduction. 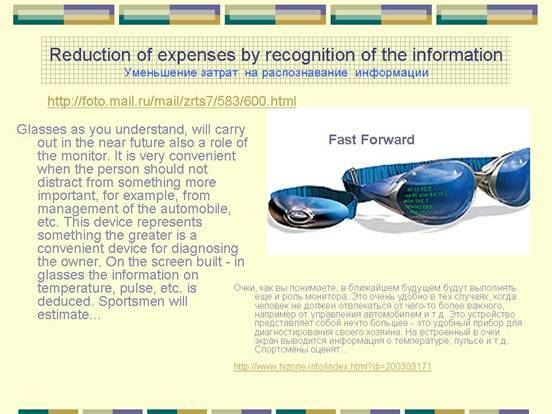 In this case we are talking about the expenses on the information recognition. 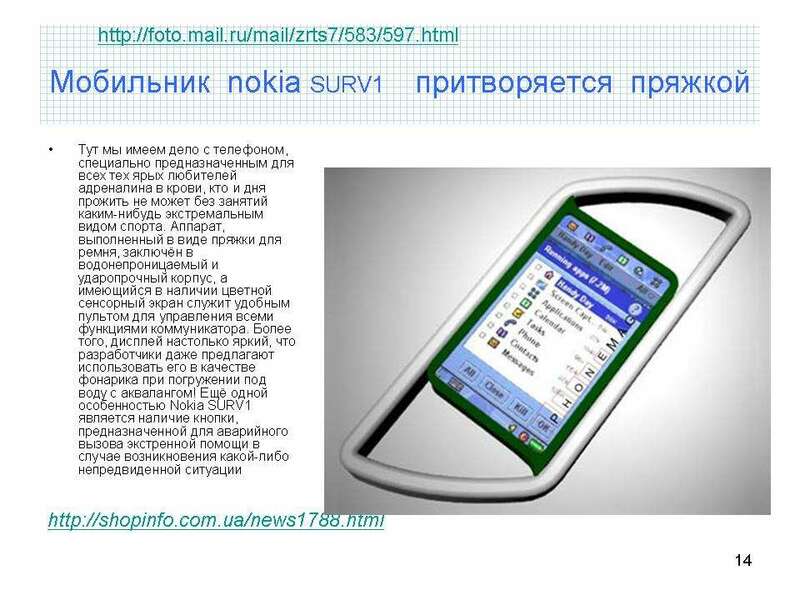 The developer claims that this solution has great perspectives in the market of mobile telephones. It’s quite possible. “Pocket television” already exists – I saw this product appeared in South Korea. Its price is still high, about 400 USD per month. But to think that there are no perspectives would be wrong. In all these product groups there is a tendency of “cheapening”. 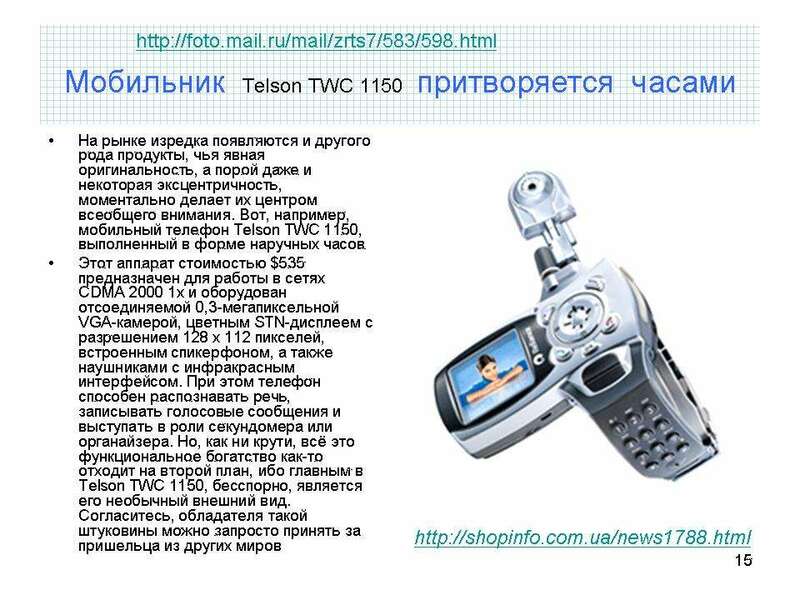 The first mobile telephones appeared in 1994 in Saint Petersburg were about 1000 dollars and as to me, for example, I spent 600 dollars on communication in December of 1995. You could agree that it’s difficult to forget such an episode J. I even kept this payment document ‘for history’ because I understood that one day this would be “absurdity”. Finishing the study of the subject “Economy of movement” we can offer an approximate set of evolutionary conditions which would be comfortable for “recognition” and use in the capacity of one of numerous models while projecting and building a predicting decision. On the analogy of the trend “dinamization” – monolith, hinge, many hinges and etc, or trend “state of aggregation of matter of working organ” - hard body, liquid, gas, plasma, phase changes, combined conditions (foam, jell, spray and so on) – it’s possible to offer a more “humorous” than really “exact and scientifically grounded” set: “2 hands + 2 legs”, “2 hands + 1 leg”, “2 legs + 1 hand”, “without legs”, “without hands”, “using only 1-2 fingers”, “using only eyes”, “using nose, ear”, “refuse from using external anatomic organs”. Place in these variations glasses, lenses, mobile telephone hands free devices, chips for biometrical identification or new patented devices of image creation in a human brain and all these fantastic things may be used one day. This slide illustrates one more scenario of modern technologies development. 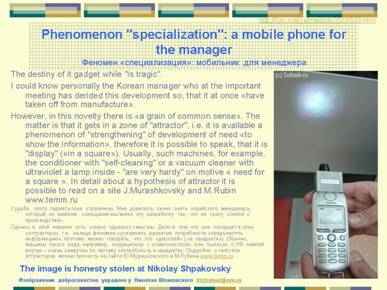 It is difficult to relate this mobile telephone to the bunch of scripts connected with “economy” though it has an indirect relation to it. 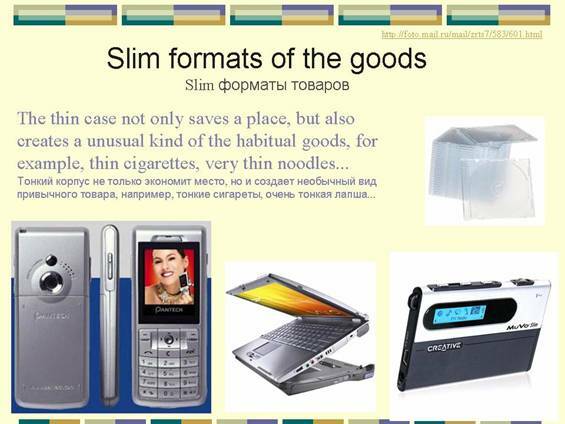 To answer the question “why do we need very slim mobile telephones, cigarettes, thin noodles, cases for CD/DVD?” is simple in the following way: to surprise people around. 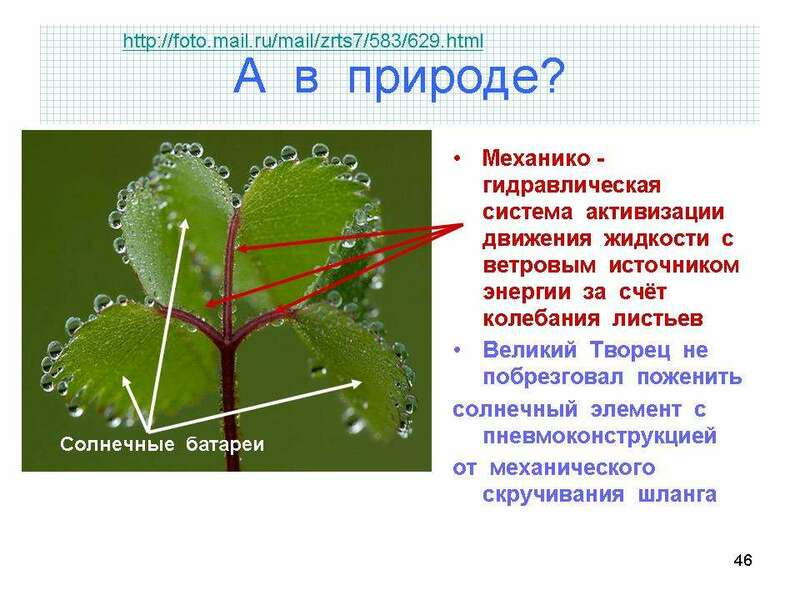 However it is possible to answer in a different way: very thin mechanism will “economize” space. It can be used as “a tassel in a notebook”. 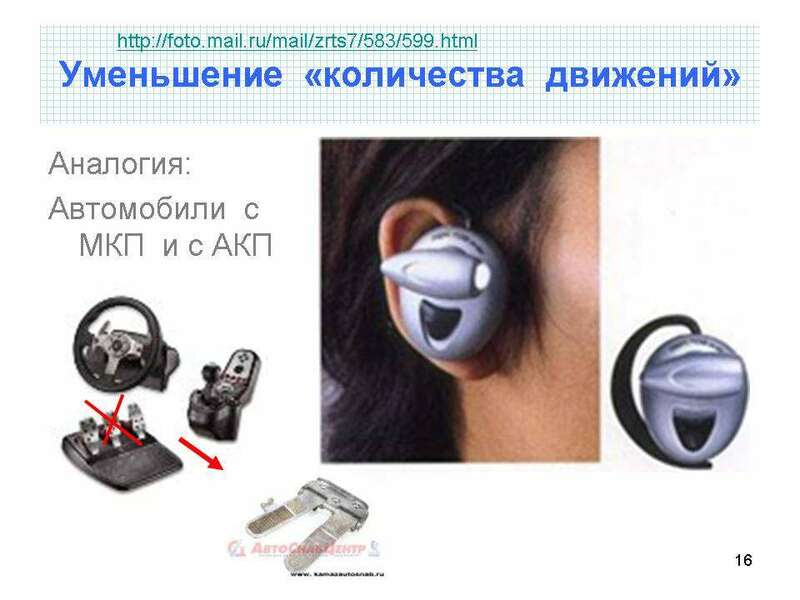 Analogically you can ask the following question: “why do we install vibromassager in a car armchair?” Well, people do it and even manage to increase sale of this car model because this trifling decision, from engineering point of view, can influence customer’s choice while buying a new car. A.Shneyder, PH.D, Y.Katsman, G.Topchishvilly Science to win in investments, management and marketing. I am speaking about “surprising options” which are similar to the phenomenon of “technical mimicry” discussed above. Is there a demonstration of this script in mobile telephones? Answer: plenty. For example, possibility to write down a telephone number in a notebook with the help of voice message; instead of a name - audio recording. One more example: give to every telephone number in your notebook an individual sound: when your boss calls you can hear caw lowing, when wife - steam engine whistle, when children – birds chattering and etc. The reason of such solutions is similar to the reason of use of “technical mimicry”: to sell goods by any means on condition that expenses on such innovation are minimal. To illustrate such non-existent yet “surprising option” I’ll make an example of mobile telephones production which changes the case color. It’s not very expensive to do this. That will be enough to watch a short video clip видеосюжет about how a car trinket which uses so-called electronic paper or e-paper works. 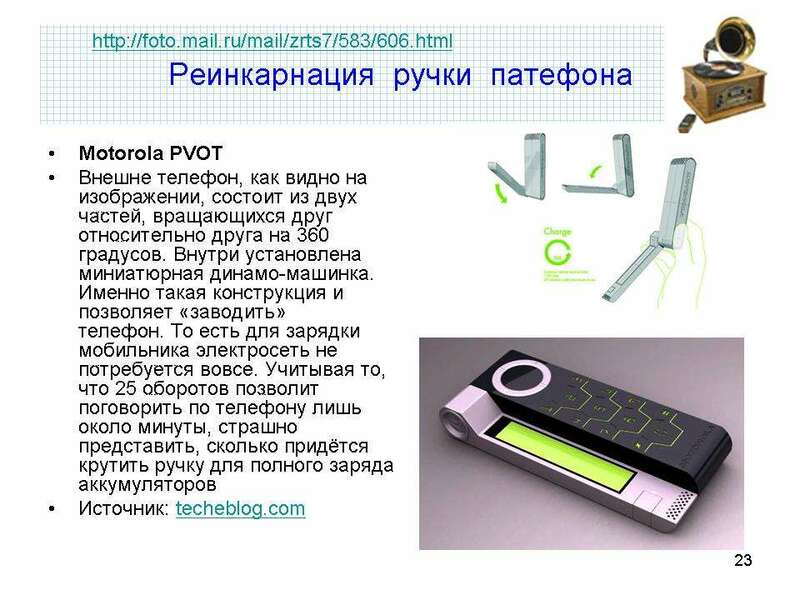 Is it possible to transfer this technology to mobile telephones case production? I’m a little ahead of time showing non-existent telephone options because all final part of this seminar will be devoted to examples of such kind. 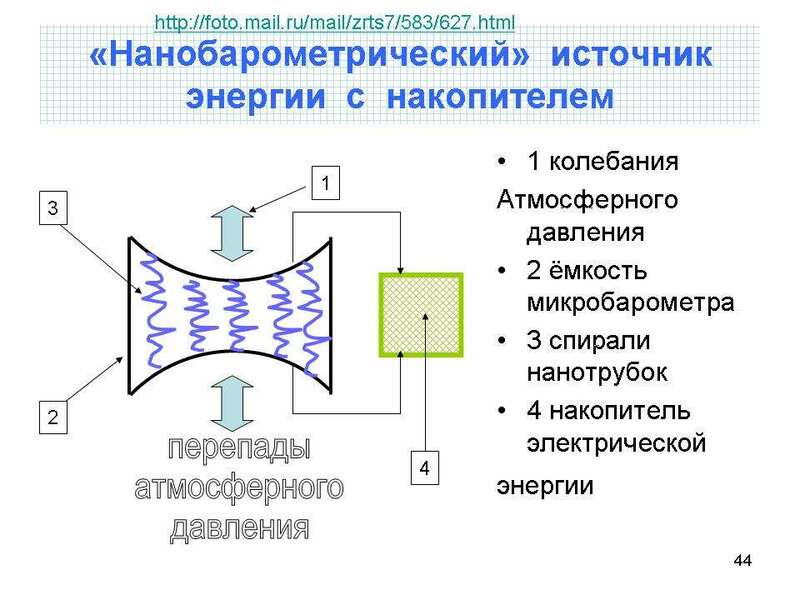 Let’s pass to the next scenario of engineering systems development which in classical TTIZ has abbreviation MATCESM (МАТХЕМ) which means use of mechanic, acoustics, thermal, chemical, electrostatic and magnetic fields in machine work. The developer of this mnemonically comfortable, but incorrect abbreviation is B.Zolotin, one of the most famous TRIZ developers who has been living in the USA for a long time already. We must pay respect to the pioneers, to those first people who “noticed” and put down new unstudied scripts in the technological development and it’s not good to blame them for natural imperfection of first models. All “young systems” are clumsy but there is a certain appeal in it. Besides proverbial wisdom says: if you want people not laugh at you don’t laugh at your ancestors. Claims to this classification model begin with the phrase “chemical fields” because this term is not harmonized with traditional sciences and makes TRIZ promotion in the field of accepted and non-deniable theories. However termogen (calorie), ether and quarks also shocked the ear. But the problem is different. Simultaneously with the creation of this term a new one appeared. So-called law of increasing SU Field interactions claimed that all systems must follow the trend or tendency to develop from mechanical fields to magnetic ones but not vice versa. It means that after the invention of chemicals for managing the grow speed of grass lawn-movers must stop their development. This mistaken point of view is taught in many schools* and brings to curiosities. I’ll tell you a story. * In Russia there are 300(!!!) TRIZ teachers they all tell THIS to children. In one world respected company in 2003 few TRIZ experts worked. 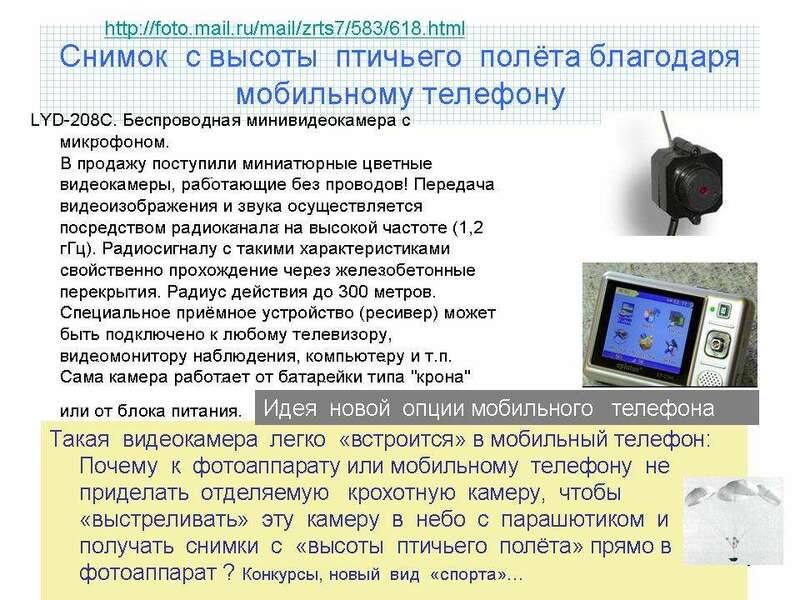 One of them with a very advanced certificate (can not be more advanced) was given the project on updating a driver to a camera or a robot vacuum cleaner. Neither machine nor character’s name are important in this story but his reaction is important. Time passed but there was no solution. Colleagues began to help him and advice but he was stubborn and said: “Why are you advising me this “mechanical solution?” Thing I need to update is ELECRO – mechanical phenomenon. You don’t know MATCESM ((МАТХЕМ)? I must look for something magnetic, you – stupid people! I can’t think “against the law”. The end! This story is sad. We are people and people like to believe in something. Even religious approaches have their fields of application. Anyone from us could be in his place 5-7 years ago. So let’s also think “against the law”. The history of technologies doesn’t know anything about our “lines” and “contradictions”. Lawn-mover designers even after petrol and electric motors suddenly “broke” their fixed “low” and gave a series of machines with a muscular driver or an auger cutting blade geared from wheels. You press the machine forward with force – wheels drive gears and untwist cylindrical knife with spiral blades. I have such a machine. When its knives were sharp it was possible to cut though with difficulties but when the knives got blunt I stopped to use it. It wasn’t exactly a law mower, rather a fitness machine for pumping muscles. The range of variants specific for macrolevel and devices of microlevel which are on this slide is not complete. 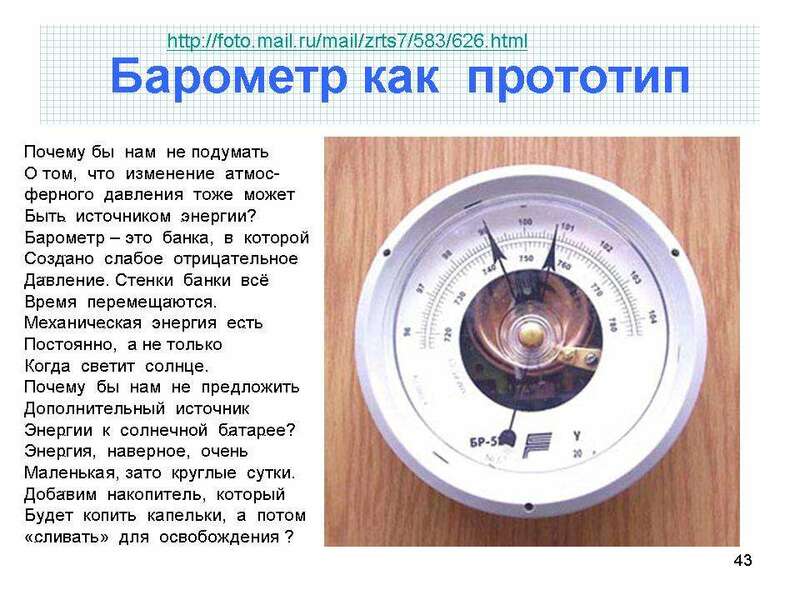 In very famous programs of Glasunov-Tsurikov and a big group of developers (Tec optimizer, Gold fire Innovator) bank of physical effects count about 700 examples among which there are surely all effects of turn of one energy kind to a different one. 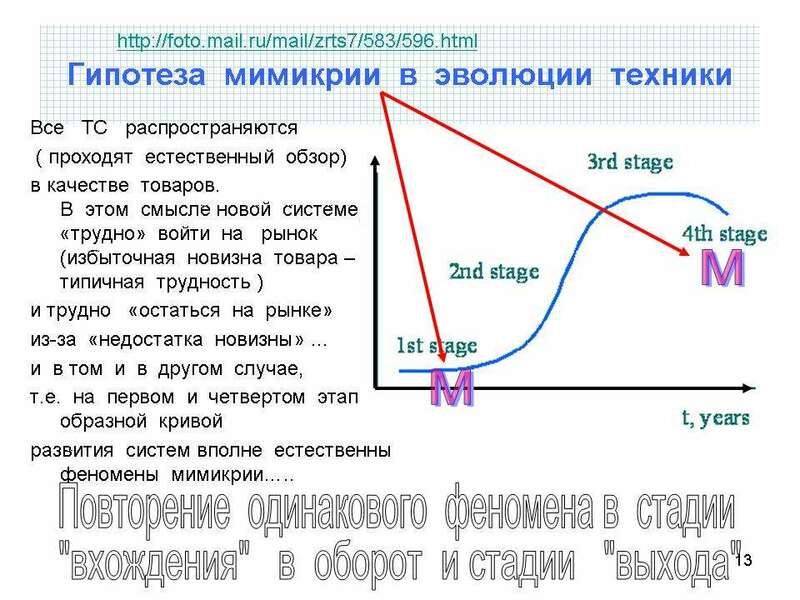 I think future MATCESM ((МАТХЕМ) is a purpose – designed soft similar to programs of «Метод» company or see here ссылку. Traditionally, mobile power-supplier is an electric battery but recently there have been a few presentations which use people muscle force for emergency regime of work. 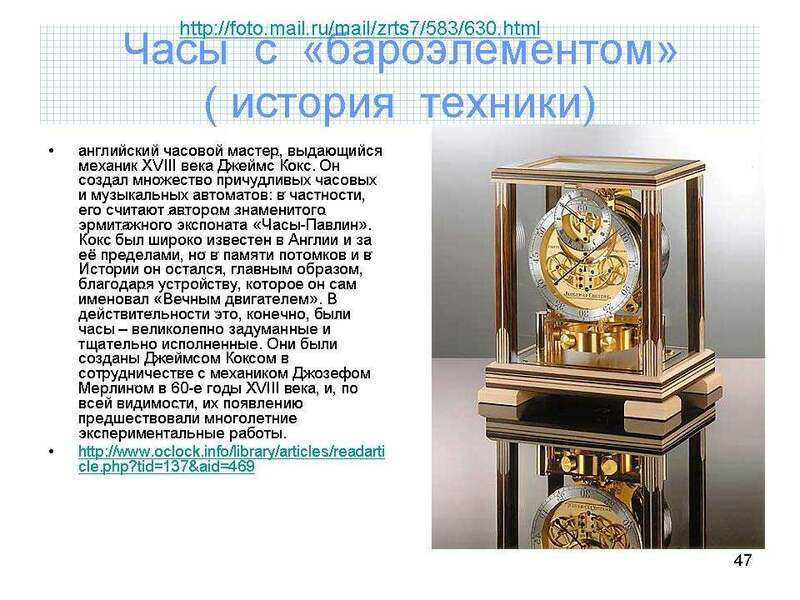 It is clearly seen from the contents is a direct projection of technologies from the past or demonstration of the dialectic law with the name difficult for understanding - “negation of negation” which is better to understand in the context of “helicity of technological development”. Now we need to make a definition of this phenomenon. “Helicity of development is a projection of technologies inside one family of machines”. In this case we are talking about the machine which is called energy source (power supplier). 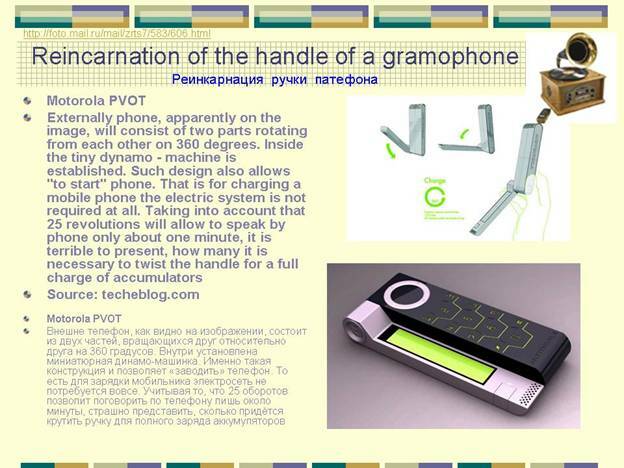 As an additional example of development helicity of power supplier we can study reincarnation of gramophone handle. Energy suppliers are specific objects of study because in the LDTS history which is 200 years old already, there have been attempts to divide all technical systems into “machines for people” and “machines for machines”. For the first time ever such an attempt was made by Shchults /9/. 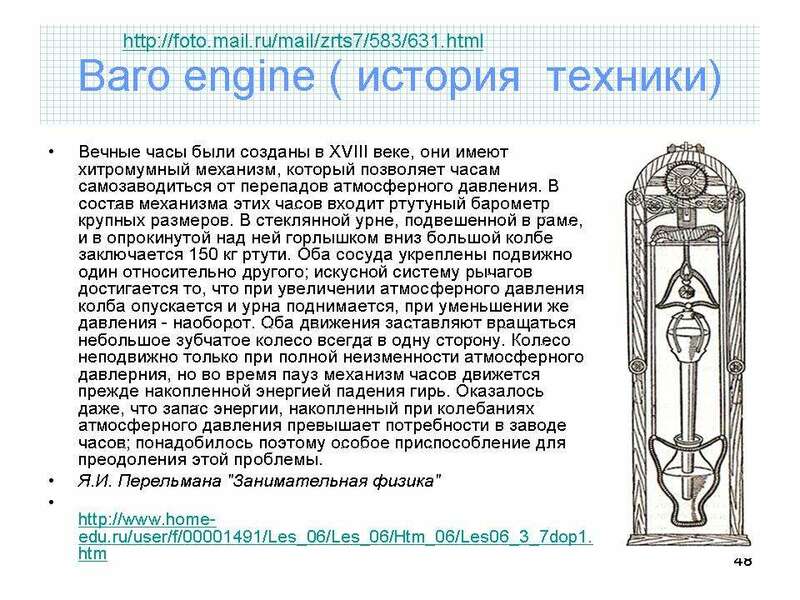 That’s why there is a sense in the suggestion to name all machines that contact directly with a man “machines” and name the systems that are always sub-systems (50 variants of propellers, 35 kinds of mechanical transmission, glues, 28 kinds of welding, 15 kinds of springs and etc.) 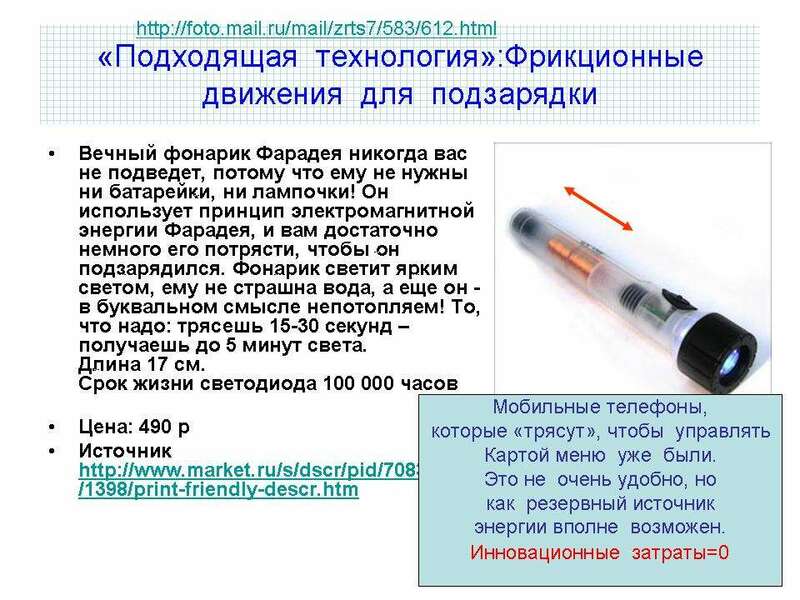 – “Shchults machines”. By the way, I have been trying not to use the term “technical system” for long time to avoid programming myself on creation models which never take into consideration marketological specific of technological evolution. When classical TRIZ was created there was no term “marketing” in the lexicon of people living in the USSR. The evolution of technologies can not be identical to the evolution of living organisms (according to Darvin) as well as law of machine development for people can not be projected exactly on the microlevel. For example, Shchults machines are conformed to Moor law while machine for people are outside of its influence. 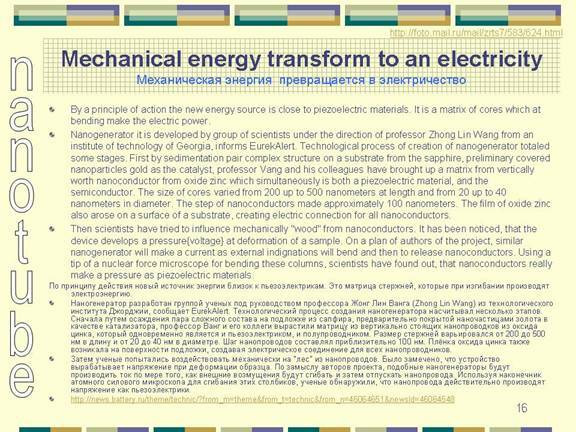 Machine for people can work according to the script “transmit to micro level” but glue or technologies of epitaxial bite can’t have such “transmit” theoretically because it (glue) is already on the micro level. I’d like to notice that this is one more hypothesis of technological evolution which can be studied in a thesis work on the subject “Search for specific laws in the evolution of nanotechnologies”. Here is an example of common for Shchults machines and for machines for people laws demonstration. 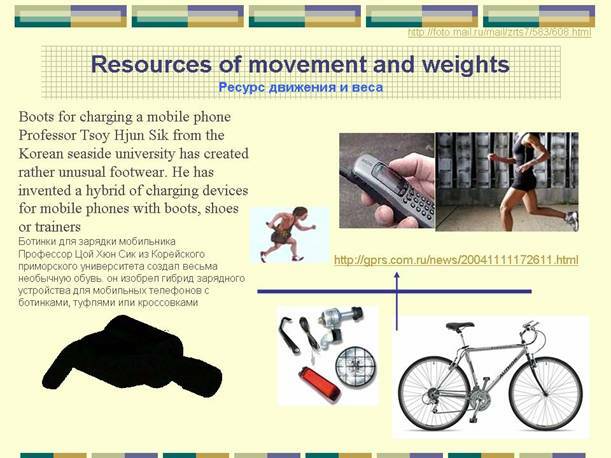 Here resource of movement and weight is used to create a reserve source of energy of a mobile telephone. 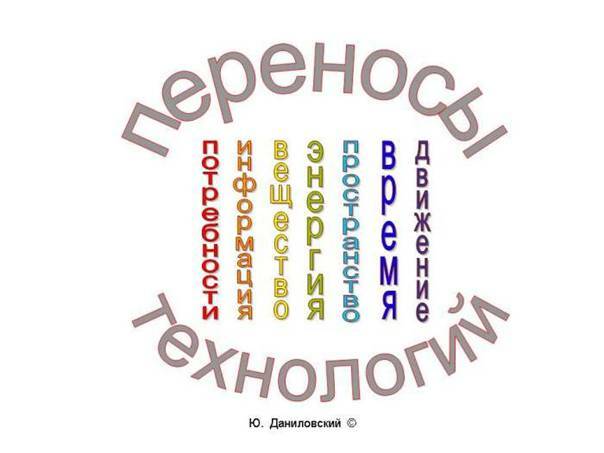 The series of examples on the “use of weight” you can see here здесь. Energy sources in this new Chinese mobile model are capable to power solar battery both from the sun and from lamps. Solar batteries which use two and more spectral bands to turn photon energy into the current are known. 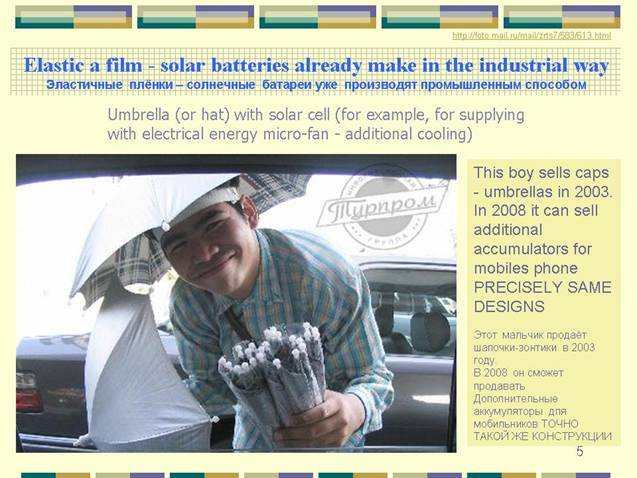 These are “interferential” solar batteries and we can say that well-known script “mono, bi, poly complicated” is realized here. In a new presented today classification system that can be called “TRIZ for forecasting” if use imagination, a wider and more detailed approach is used for description of “combination phenomenon” феномена объединения. In the frames of these systems “interferential solar batteries” are combination type “many equals” with few changes in the main parameter, in this case - frequency of line in the spectrum. I can make an example of how this script is realized in power-suppliers. 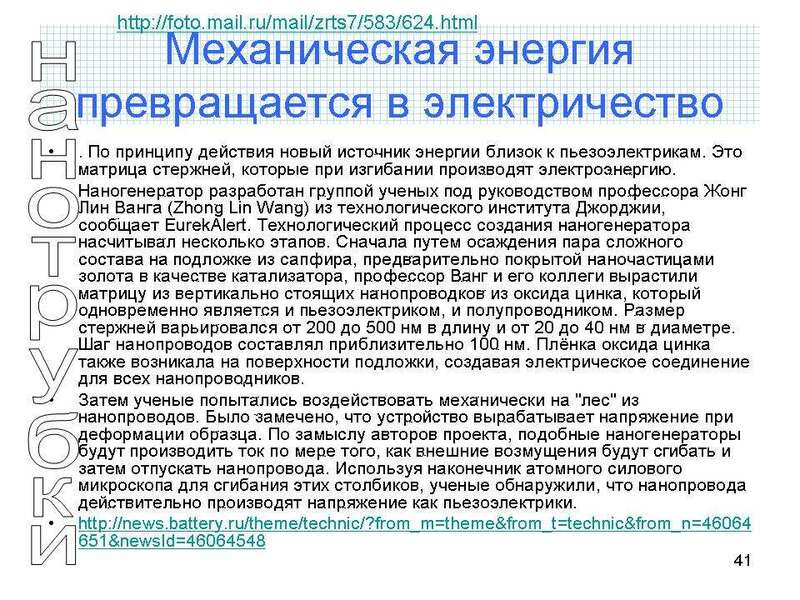 This is the script we have already discussed “specialization - universality”. In camera power-suppliers there are unique elements which are created to make the work of machines safe from somebody’s batteries of poor quality; but there is an opposite tendency: to design power-suppliers in such away that they can be changed by ordinary AAA batteries. The same script from camera field is transmitted without any changes to the field of mobile telephone projecting. Let’s pass to the final stage of our seminar. We’ll study different hypothesis, “forecast decisions” that can be got using the carry of technologies concept or “TRIZ for forecasting”. How “forecasters” read magazines about mobile telephones. Training course on technique evolution script recognition we have already done while reading the magazine about new mobile telephones. It necessarily transmits to the phase of hypothesis about what new characteristics tomorrow mobile telephones will have. 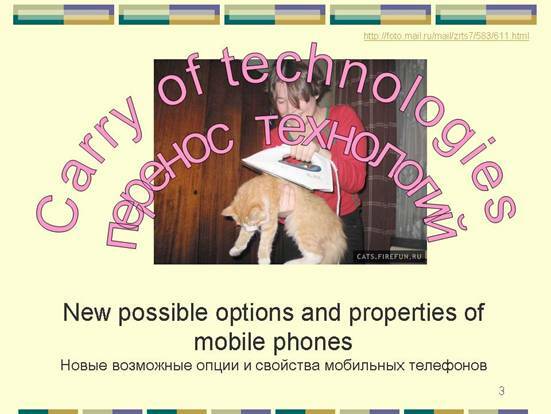 For this aim I’ll use the phenomenon of “carry of technologies”. Under this phrase I understand phenomenon of use of solutions which recommended itself in many fields having the same problem. 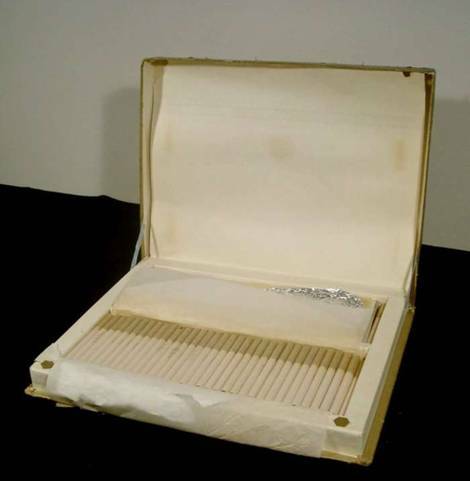 A simple example illustrating the idea of this engineering action is as follows: laptop design and design of a box for cigars. Similar problems: “to protect from external mechanic influences”, “to make “protected» available easily”. All this allows to use the same construction. Or another simplest example: cigarette box and lighter. In the sale of well-known goods it is often necessary to create “a surprising option” ,we said above, to make a “rebranding”an din such away increase the demand or to offer a new brand for attention. 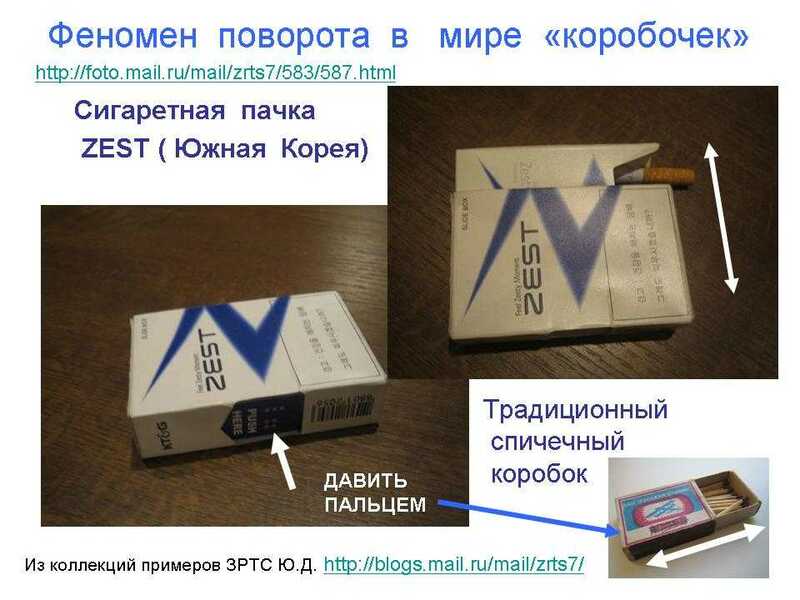 Traditionally the construction of a cigarette box can be changed into the construction used in a lighter. I don’t give examples of Zippo lighters because these solutions are well-known. Mobile phone has many drawbacks. That is to say they are the starting points for making our hypothesis about possible changes in construction and characteristics. In this review we’ll study only “micro level” of users’ characteristics without any deep analysis of technologies of data carry. Any telephone will always have the problem of lack of energy store in the battery even if it can work 30 days. People are created like this: “everything that can be forgotten to do – will obligatory be forgotten to do” but they will always appreciate positively the offer of a service “cheap spare device”. 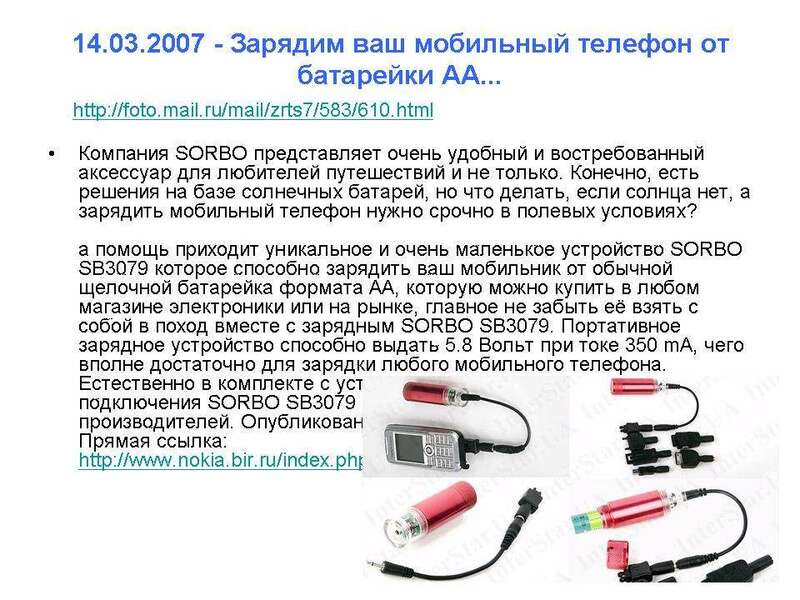 It’s better to search for such technologies in machines with the similar characteristics, for example: portable source of light - torch. 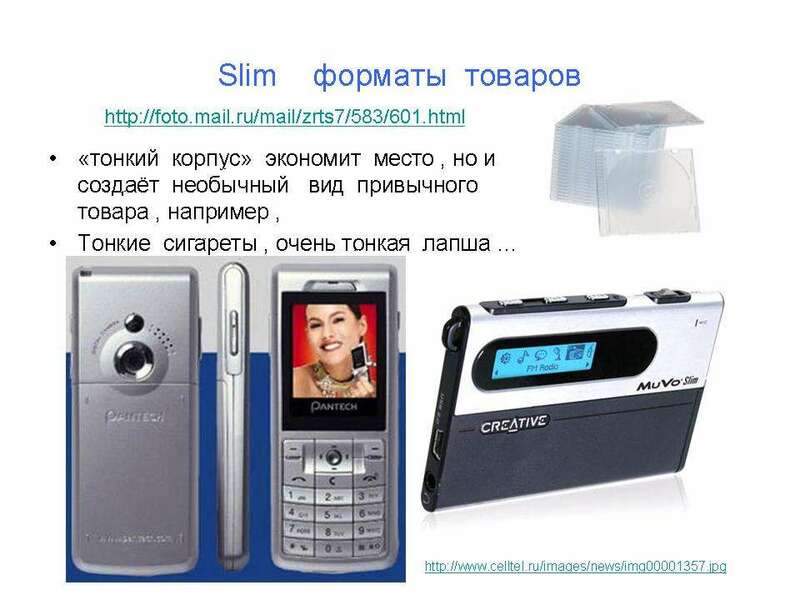 Relatively high probability of such solution appearance is conditioned not only by the fact that there are no innovative costs in manufacturing this product but, this is very important, there already were tries to create a mobile telephone which you must shake to manage movement operations inside the menu. Consequently there are no innovative costs for this “surprising option”. On the analogy with the speculations about conditioners I made an example illustrating “theory of attractors in technique evolution”, it’s possible to speak in favor of mobile appearance with “two surprising options” simultaneously. Some years ago modern solar batteries became “elastic” and cheap enough. 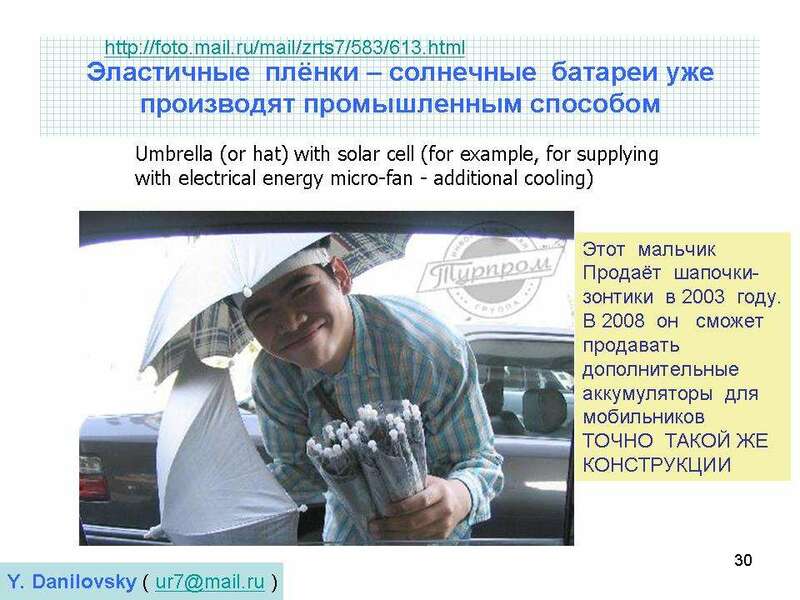 This can allow appearing of such possible “novelty”: additional power-supplier in the form of folding hat on the base of old people invention – umbrella from the sun and rain. Such hats mustn’t be easily “invented”. We can get a complex of advantages of combination, of “attractor” type. 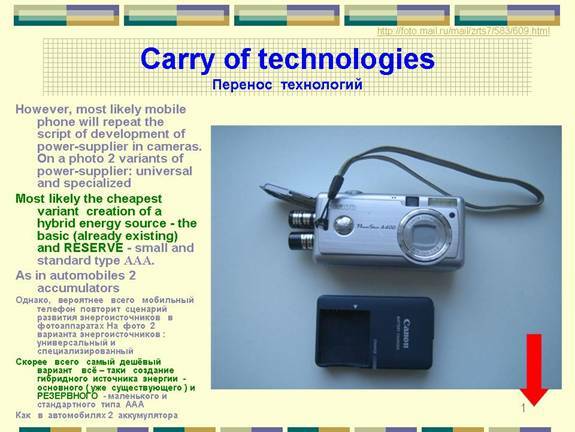 Following the idea of search for carry “appropriate” technologies of alternative power-suppliers you must remember that telephones have already entered the field of “specialization” in their evolution. 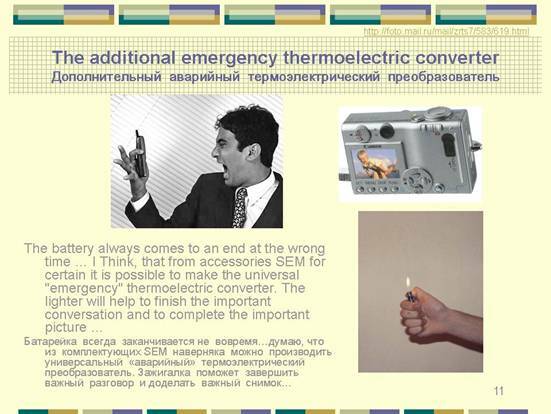 We can easily imagine combination of mobile telephone battery and usual thermocouple in mobile telephone for smokers. A good and reliable lighter which is often lost by smoking people can be built in a mobile telephone without any innovative costs. The example of such solution can be ball-point pen combined with a lighter or pen combined with a comb because all these things people have in their pockets. I’ll notice one more variety of machine combination which is not studied well though it is evident: combination on the motive “often appear in one place”, for example on the table, in the pocket and etc. We studied only few examples of getting over the drawback: “battery came to the end at the wrong moment”. However this is not the only drawback of mobile power-suppliers. We have already studied such models above, models in which solar battery capable to charge not only from the sun, but from a lamp. Use of environment resources is a very old device. It’s enough to remember line whitening by keeping it in the sun, technologies of conservation (drying) products and many other ways. 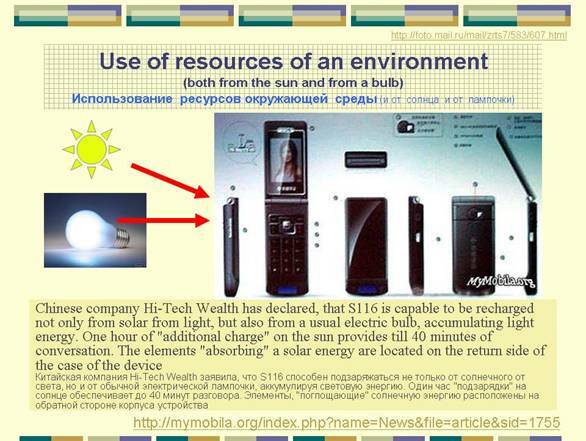 Use of the sun for the work of mechanisms and electronic devices is only possible solution in this direction. 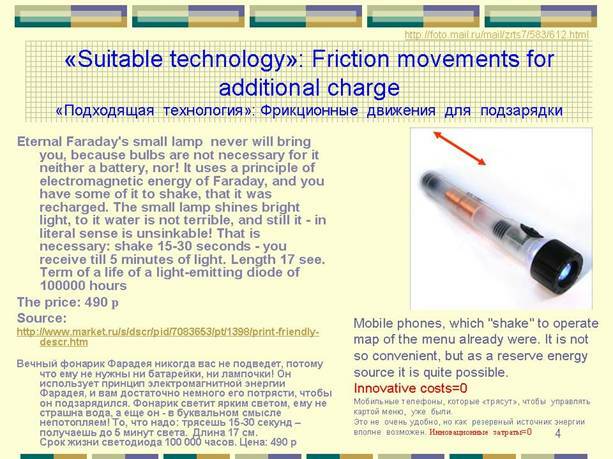 Think, except sun resources, electric lamp light, people movement and weight for making current in “electric boots”, we have one more always existent energy resource – energy of differential pressure. The simplest excursus in the history of technique shows that there have already been such attempts and really successful solutions. 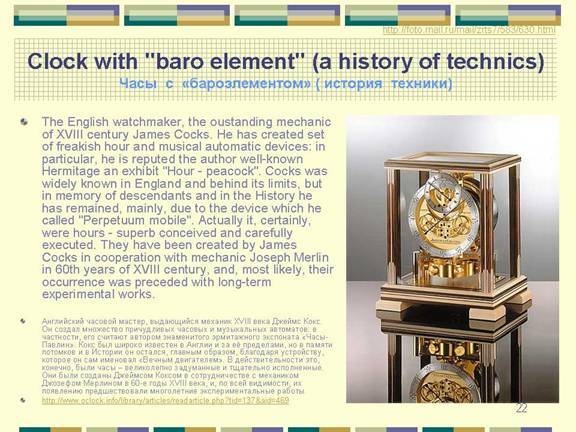 Successful attempts were made not only by many unknown masters but by famous watchmaker James Cox. Historical analyses are a very important component in the use of carry technologies. Not without a reason there is a common saying that it is impossible to know the future without knowing of the past. In the market of professional devices innovative processes support but there is still not a single “manual on the technique evolution as a manual on analogies” or special manual on the carry of technologies. Historical analyses can be added by the analysis built on the bionic concept created 45 years ago and of course there is not a manual with systematized material. In the context of this situation we can ask a question: “ Is it possible to make an example of a good combination of different nature power-suppliers in one device?” For example solar battery or hydro mechanical device? From my point of view it’s quite possible. 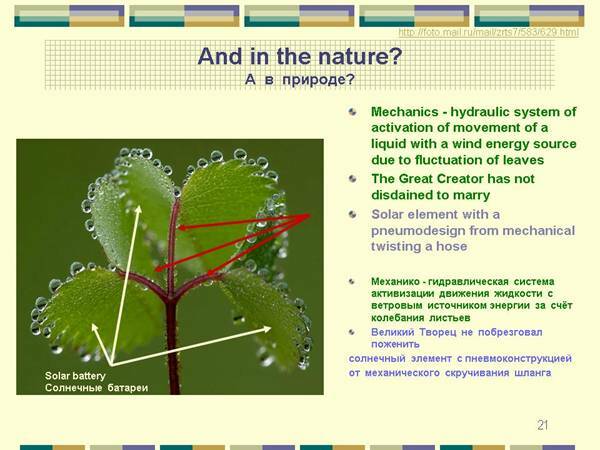 Of course the process of photosynthesis is not a solar battery in its literal understanding. In this battery quite different processes happen. 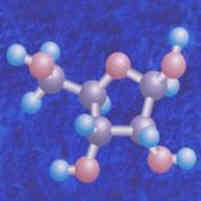 In mechanism of liquid lifting in a plant capillarity phenomena described by Jurrene are used. Also a mechanism of a pump based on the effect of twisting a hose is used. Wind fluctuate leaves in two variant of footstalk deformation: bending and twisting. So additional pumping mechanism “helps” capillarity phenomena, leaves get radiance directed under different angles that increases total quality of absorbed solar energy. This picture is my hypothesis, not more. With this hypothesis I’d like to show, in greater degree, analyses direction when use the concept of carry of technologies. 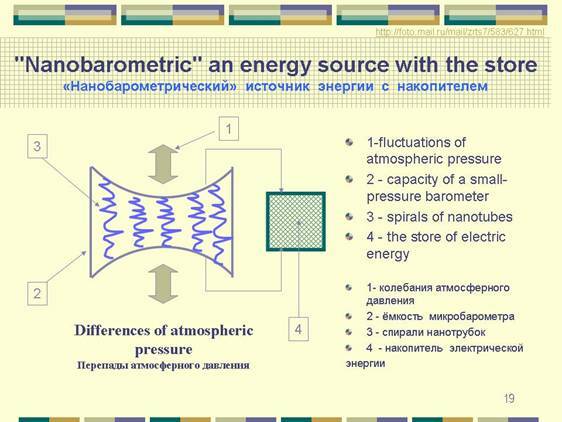 Watch that use fluctuation of atmospheric pressure is not a single example of device with “baroelement”. 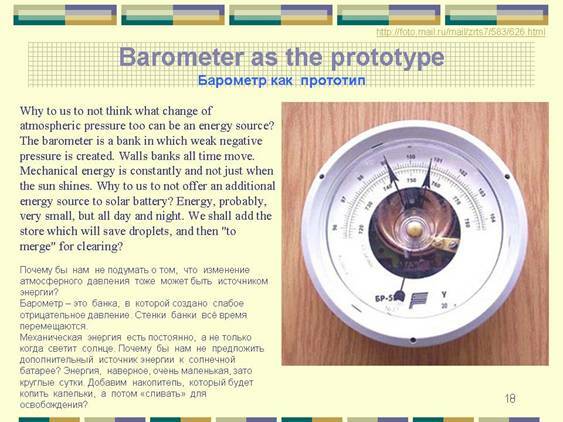 Barometer also doesn’t have any other energy source for its destination except fluctuation of atmospheric pressure. The only thing to do is to find an appropriate technology. When the search has a target, determined on such structure of speculations, it is quite possible. 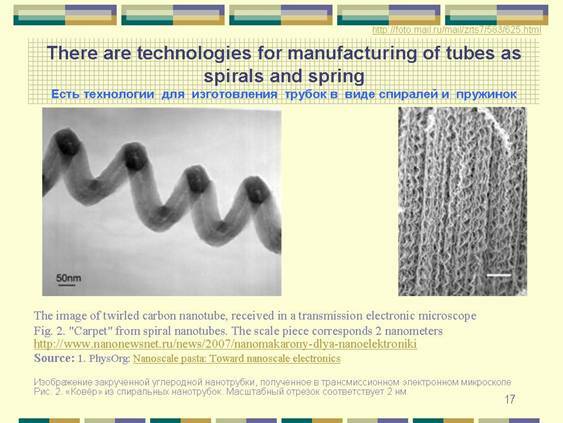 In this message spiral and spring shaped tubes are used. Having a new searching method it’s not difficult to make sure that such technologies already exist. The only thing to do is to do procedures of outline design and form your supposition in a technical drawing. Of course the possibility of appearance of such energy resource is minimal, as it seems to me. Even sketchy analysis of advantages and disadvantages makes the arrow of “expert scales of marks” fluctuate in the way of opinion “it’ll hardly ever happen”. 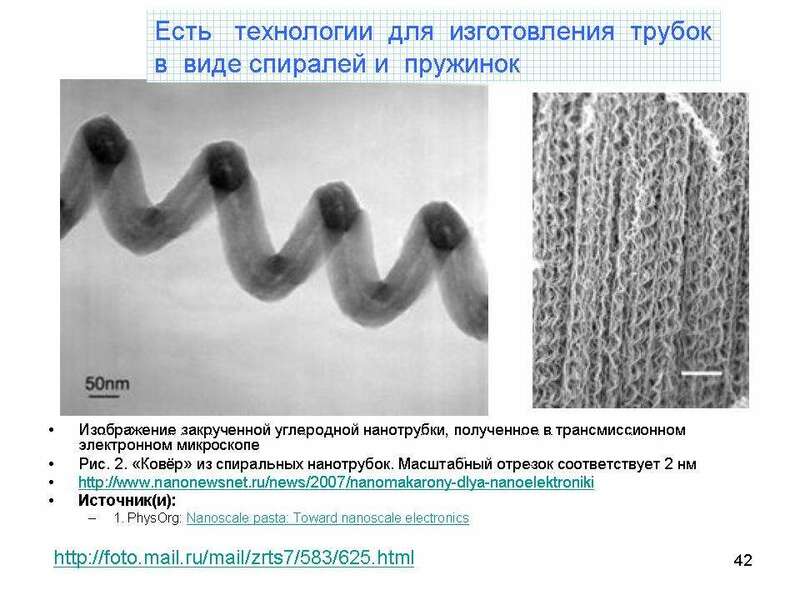 However nanotechnologies are a rapidly developing field which can answer the question differently one day. The answer will be: “it’s quite possible because the field of application of such energy source is as big as of AAA batteries but production technology of spiral nanotubes is well worked out”. 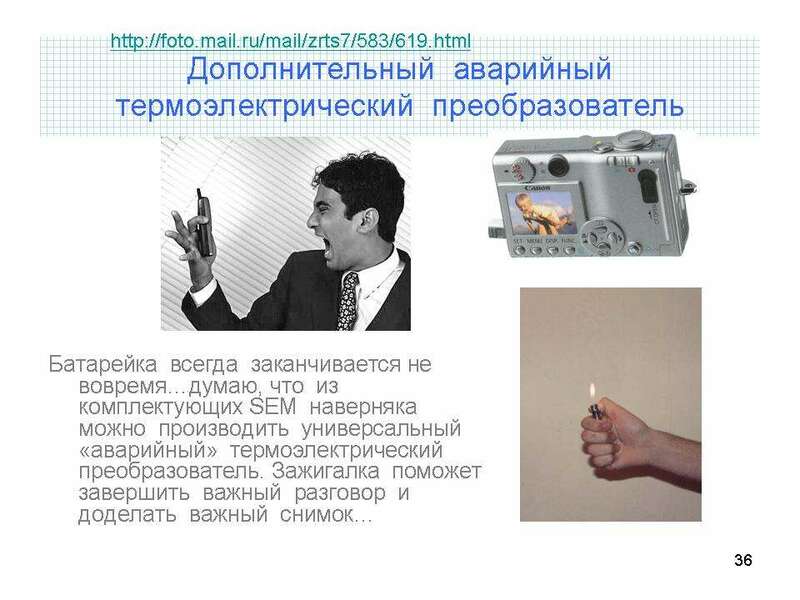 It’s quite possible that in the frames of the example of the use of approach “carry of technologies” main characteristics of “explode technology” were determined. “Explode” is the phrase from the context of the book by Christence “Dilemma of innovator” and it doesn’t mean “exploding work”J). 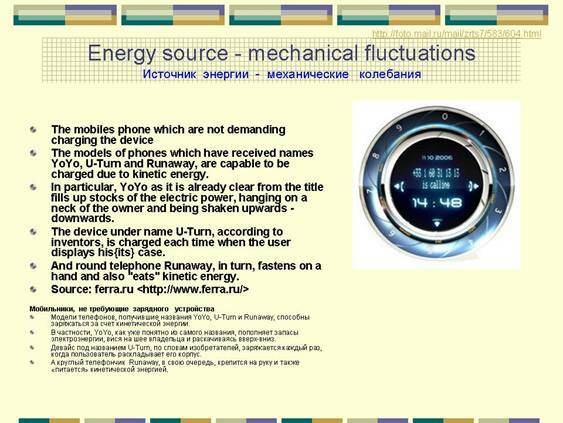 Electromechanical sources of current occupy a great place in the market of energy sources. It would be quite natural if manufacturers patent this decision because of the idea of “innovative safety” or “just in case” to make their business in electromecanical batteries manufacture safe. Finishing with the energy sources let’s pass to the other options that don’t exist yet. 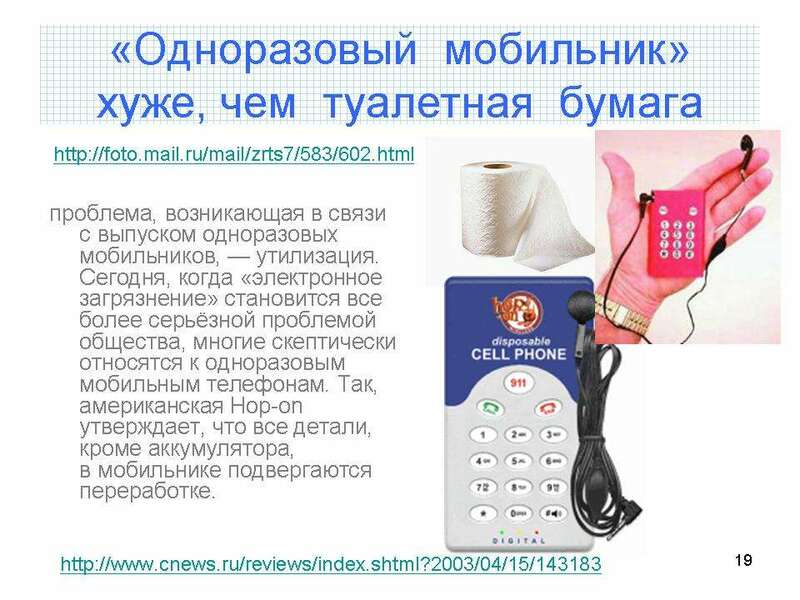 In the market there is already a mobile telephone “for old people”. Directions for the further specialization can be as many as “weighty in number” social groups: fishermen jog lovers, football club “Zenit” fans (I’m from St.Petersburg and this is not a threat J), people with the bad eyesight, who would take a magnifier from a pocket with great pleasure to read small print on the medicine instruction in a drug store. 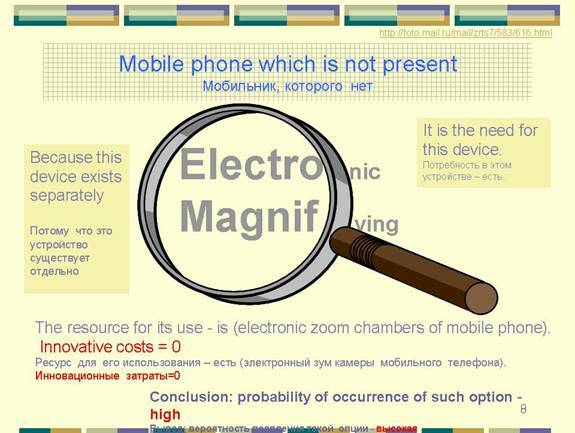 “The absence of magnifier” in a proper place and time is a quite “workable drawback”. Even more, number op people with this problem are 25% of consumers. Remember that in the digital cameras of mobile telephones there is an electronic zooms so it is not difficult to imagine possible existence of such option. Reasoning during expert evaluation of possibilities of this event realization will be based upon historical analysis of precedents. And it is so. 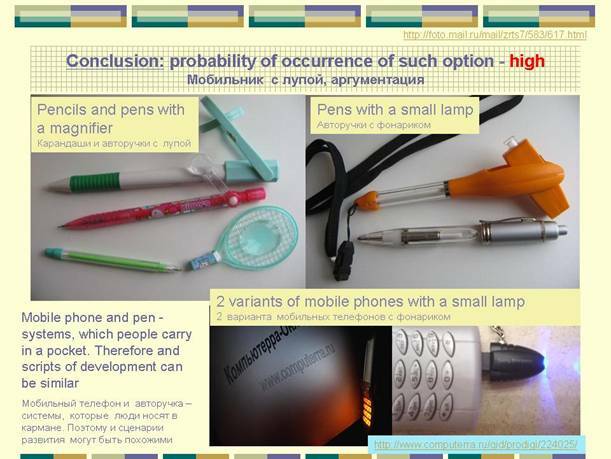 Things that often appear in the same place (table, pocket, rucksack, bag) such as: pencil and magnifier, pen and torch can be easily combined this is illustrated by the following slide. On the same motive “specialization” and already existent resources of development in the form of a camera which is in the most of modern mobile telephones I can give three more examples of quite possible but nonexistent options. According to statistic number of people with diabetes is constantly growing in all countries of the world. 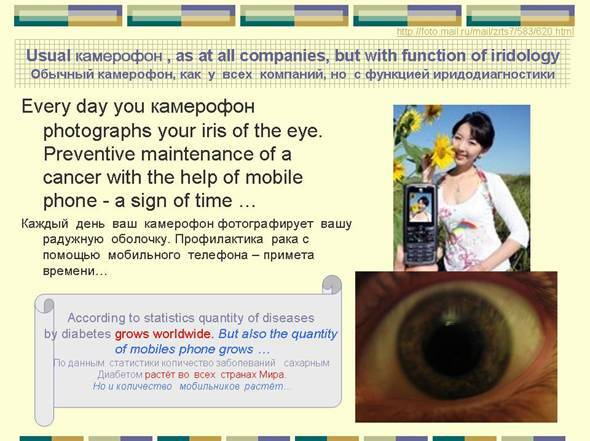 Thereby technologies on computer diagnostics of iris – “iridology” are quite capable to diagnose this disease on its initiatory stage. For this aim you simply need to take a photo of your iris. Mobile telephone will send your pictures to the clinic where a special program analyses them controlling all changes and if it finds a threatening symptoms it will send you a SMS invitation to have more detailed diagnostics. 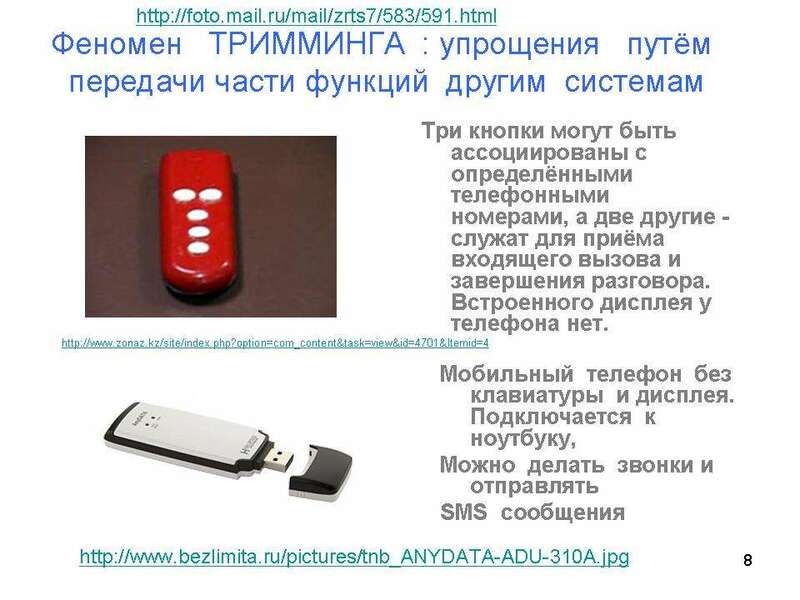 The possibility of such event, mobile telephones with the function “controlling doctor”, from my point of view is very high. Innovative expenses are minimal and social importance is high. The next example is related to the zone of “need for entertainment” and specialization. 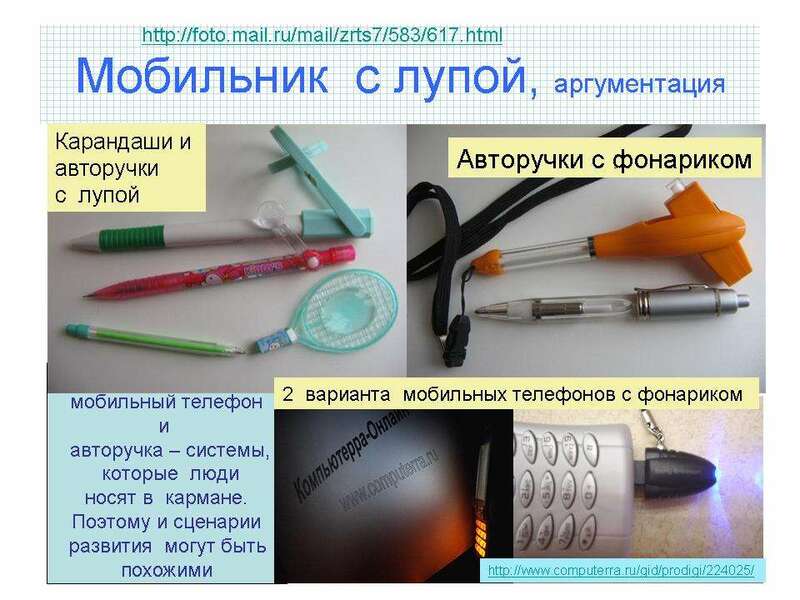 Mobile telephone for “women” exists in the form of machines with unique design case. However in the market of modern programming products there are programs able to choose a hairstyle. 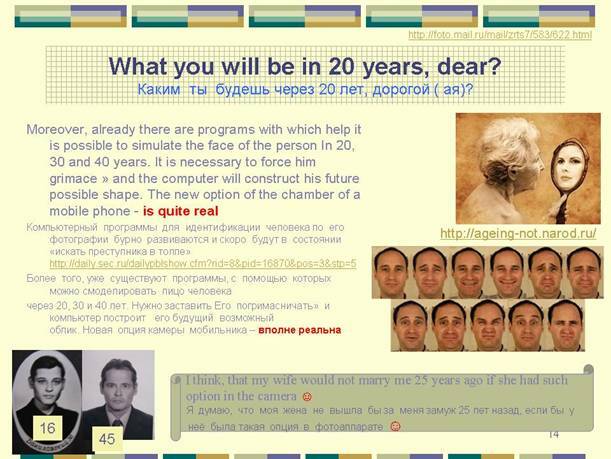 Besides there are programs capable to answer the question: “how a man will look like in 10, 20and 30 year time”. This problem can be related to the sphere of women interests more than of men. It’s difficult to have expert estimation of installation cost of such programs I mobile telephones. I’m sure programmers and telephone engineers will do it easily. My task in this training course – to make a guess, so it means to formulate one of forecast solutions and to show the technology of this process. 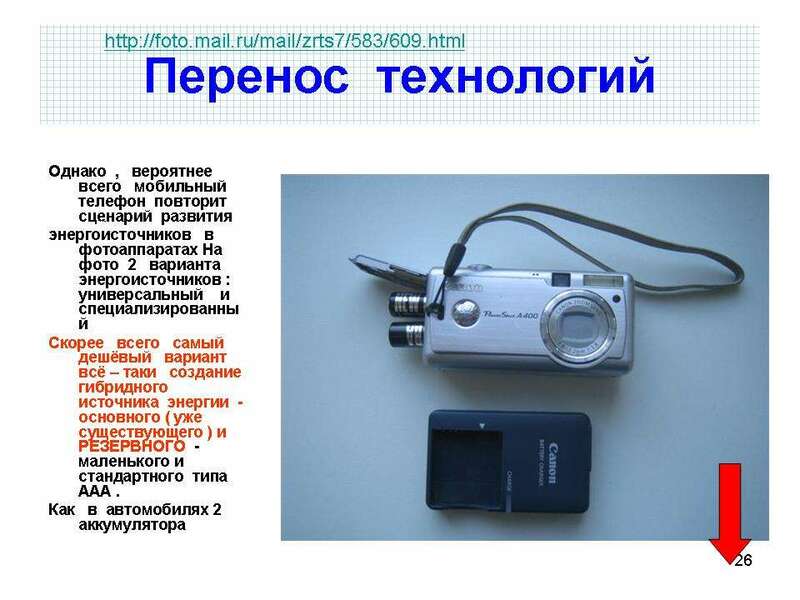 Final example of mobile telephone camera as a resource of its further development is related to the drawback and any amateur photographer comes across it. When you come back from a trip you find out with a surprise that among all photos there are no pictures with you. Traditionally this problem is solved with the help of portable foldable support. However there is one more “relative” motive which can be used in a new product creation. The matter is that among amateur photographers there are “groups on preference”. Some photographers like take pictures of nature, other – of animals or flowers. Here the question appear: “can we create a new group on preference?” My answer – “yes, we can.” Not only demand breeds supply but vice versa. 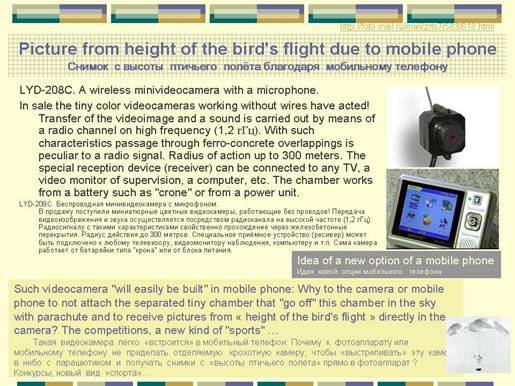 Imagine, you can up cast you mobile telephone, for example, for 50 meters. When it is in the air it opens a little parachute and while falling down takes pictures of everything below. Believe me in this short video recording you can find some funny pictures. For technical support of this idea we must only make a little parachute with a suspending which will fix the camera in a proper position. Simple wire frame for mobile protection from hitting the ground in case you fail to catch it and a simple “thrower” like “children seesaw” or “ballista”. Pay attention that peculiarity of this forecast solution is not only projecting of a simple construction but also projecting “technology of entering the product to the market” by, for example, special making a “club” with “program”, plan a highly qualified developing manager as its head. I think I gave enough examples. All set of possible solutions you can see in my virtual museum of techniques at this address адресу..
Those who want to see everything - will do it themselves even without my explanations because the logic of building has been already demonstrated. My final conclusion is the following. In classical TRIZ the main idea is the formula of understanding which is not very comfortable for solutions of forecast tasks. Compare two paradigms: “technical systems develop by technical contradictions solving”(classical TRIZ) and “people develop artificial systems (machines) in the direction of drawbacks removal on the one hand and to benefit from machines spread on the other hand using resources of the least cost”. So this is the very idea I wanted to demonstrate in this training course. The central phenomenon in the technique development is the phenomenon of carry of technologies which must be in the theory relatively to all main categories of resources familiar to us. Needs, information, material, energy, space, time, movement. We don’t have this theory yet but it is possible to be created. Tanks for attention and patience.